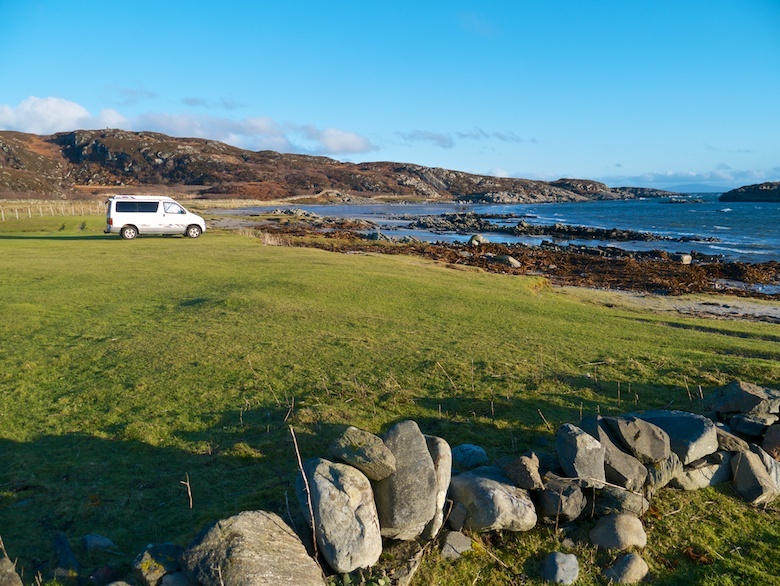 Before setting off I had read of a special little campsite hidden away on the Ross of Mull. With its twisty single track roads Mull feels surprisingly large. It took a while to navigate the Bongo to the west. This was in part due to the stunning scenery around every bend, along with the fact that a low winter sun had made an appearance. 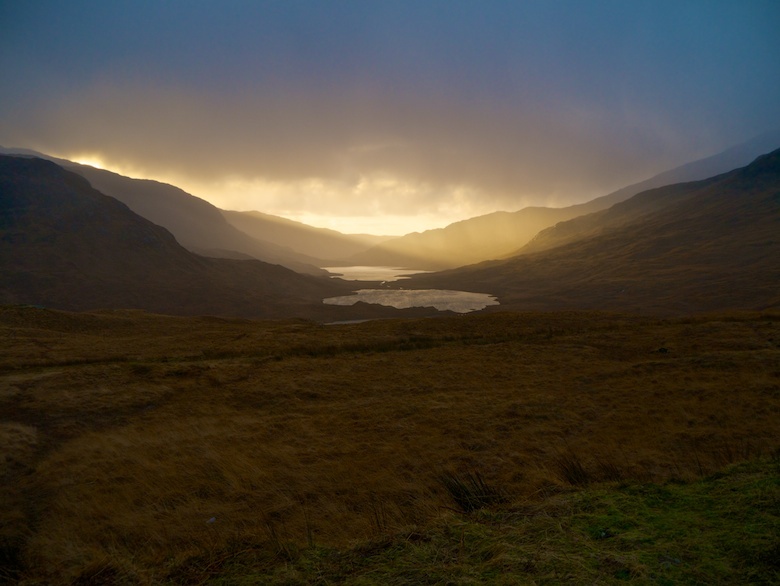 You may have heard about the quality of the light in the Hebrides, it really is something that you have to experience yourself. 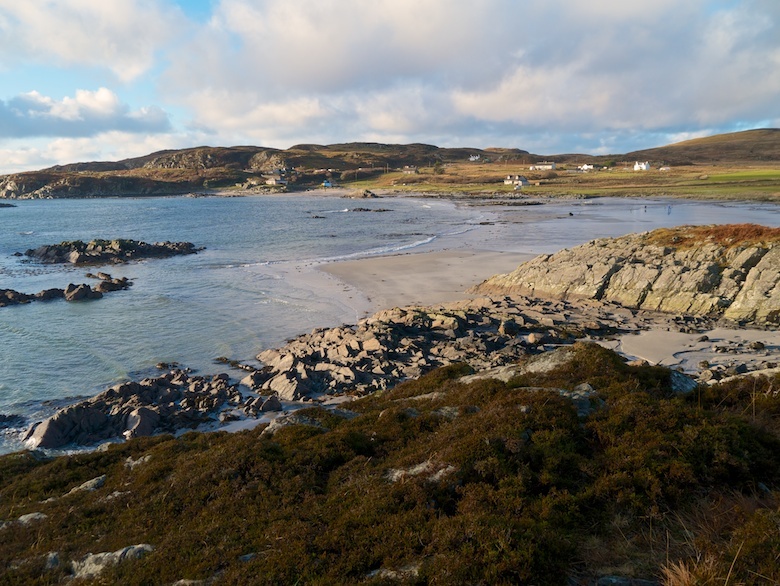 Our destination was the small and perfectly formed Uisken beach and possibly one of the finest located campsites you could hope for. Basically it is a stretch of close-cropped grass right next to the beach. With high tide the beach disappears and the sea is lapping literally a few metres from your pitch. A sign simply requests that you seek permission from the croft before pitching (I think that they ask for £2 per unit). This I duly attempted to do but no one was home. Being the day before Hogmanay I was of course the only one there. With no facilities at all (i.e. toilets or running water) the Bongo with an emergency portaloo was the perfect accommodation. The rest of the afternoon was spent exploring with Reuben before getting some use out of the camping chair for the only time during the week. I sat wrapped in down and watched the sun set, keeping warm with slugs of single malt until the stars came out. It was soon far too cold, magical surroundings or not and the van beckoned. Of course dawn brought totally different conditions. When I woke the van was once more being lashed by rain and rocked by winds. The area was transformed into somewhere bleak and inhospitable after the benign evening before. At midday a weather switch was pressed somewhere and the grey clouds lifted and the sun came out. The speed of the change was swift and dramatic. Time to open the door for the first time that day and explore more of our surroundings. We walked no further than perhaps a couple of miles but I was in no hurry. I just wanted to poke around a few corners and see what was over the headland. Another beach was found, this time uninhabited. Somewhere to sit and eat lunch whilst Reuben tried to destroy strands of seaweed. A lovely area deserving of further exploration, perhaps when the daylight hours can be measured on the fingers of more than one hand. Back at the van I sat for a while and contemplated what to do next. It was very tempting to stay for another night, however I was keen to see in the first day of the New Year with a hill. I packed up and set off, stopping once again at the croft to pay up. The owner was in this time and refused payment simply on the grounds that I was honest! An area on a map marked as ‘The Wilderness’ is like a red rag to a bull where I am concerned. I therefore headed towards the National Trust for Scotland’s Burg estate. This was via a shop to pick up some locally brewed ale. 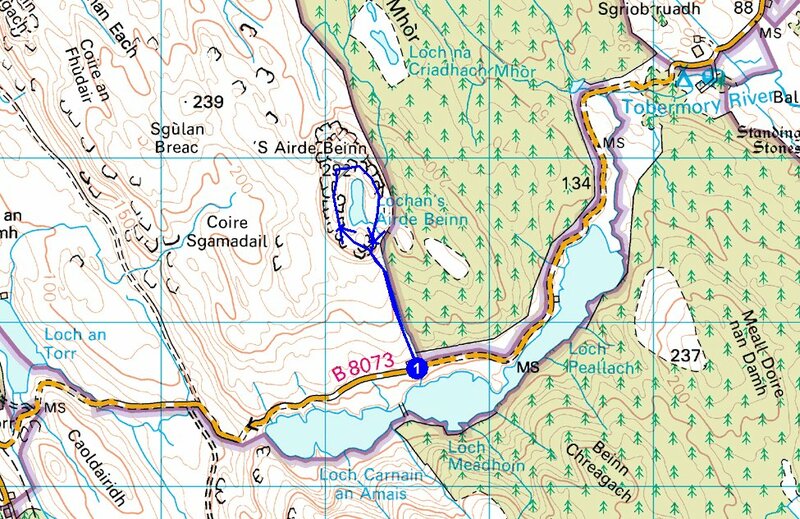 The small NTS car park is a few hundred metres down a bumpy track after the road ends. Their attitude differs from the organisation south of the border, the car park being free rather than an extortionate £7. The only downside is that it is situated on a hillside so I parked for the night at a rather jaunty angle. I celebrated New Years Eve with a couple of bottles of beer, a slug of whisky and an early night. When the New Year crept in I was fast asleep. The forecast for the first day of 2014 was for a calm and dry morning before wind and rain swept in once more for the afternoon. I was up and packed before dawn, walking west along the track as the first of the light was cast across Loch Scridain. I nervously passed through a group of cattle that were hogging the track and scattered through the surrounding woodland. Thankfully they barely batted their long lashed eyelids at either the dog or myself. 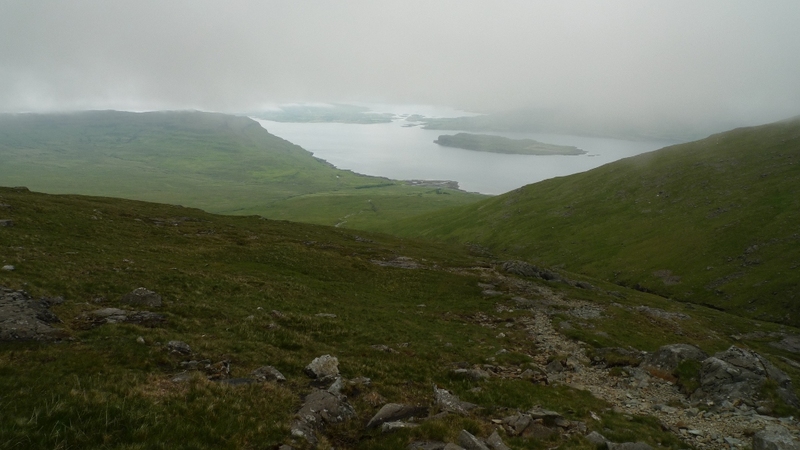 The climb to the summit of Beinn na Sreine was relatively straightforward. 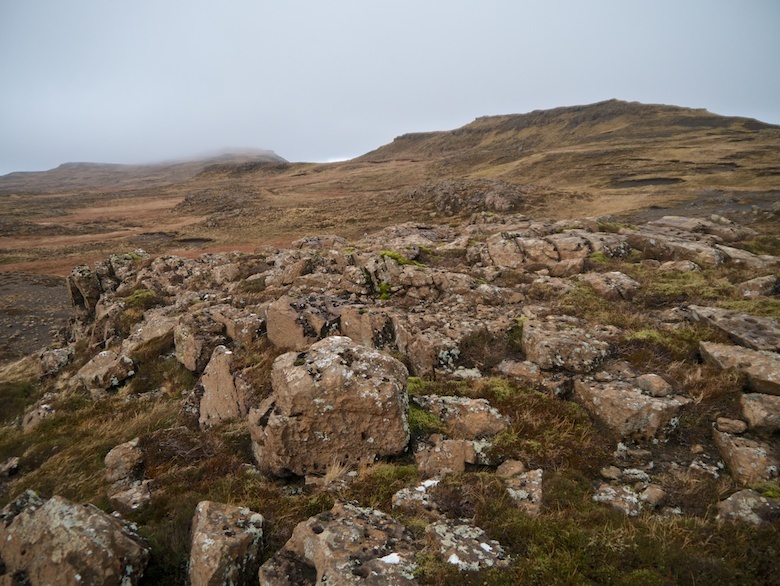 A case of picking a way through various tiers of rock before walking across a wide and stony plateau. 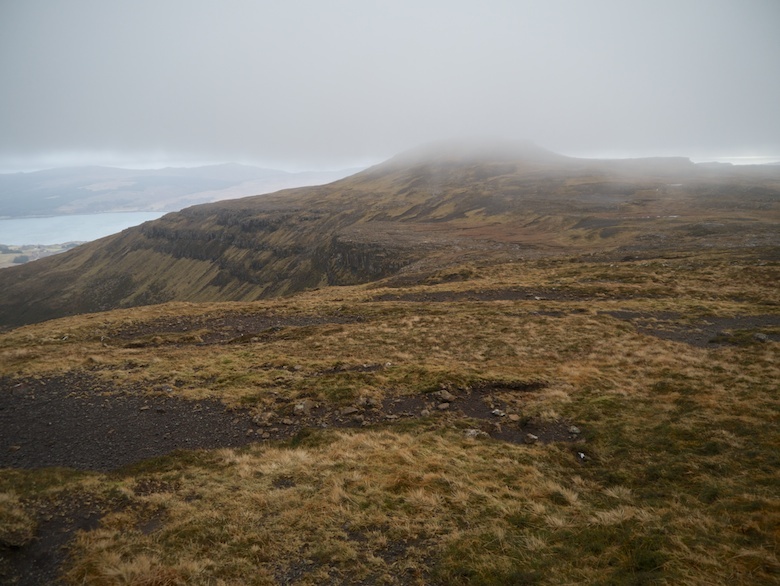 Typically the mist came down before we reached the summit, lifting once we were half way down the hill. 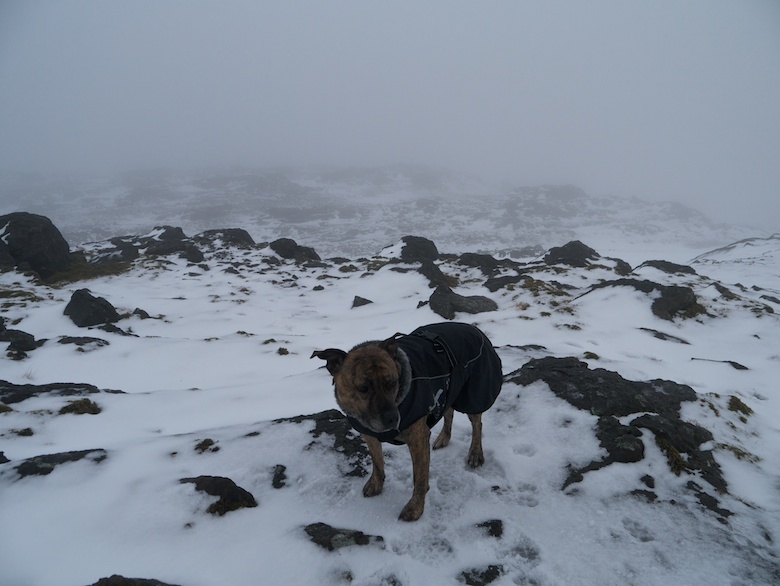 A shame about the murky conditions as I am sure that the summit view would be superb. I picked a more direct route back down to the van, the only difficulty being the man eating tussocks on the lower ground. Typically once back at the van, the clouds lifted off all of the surrounding mountains and it brightened up. The promised rain did not come that afternoon, instead passing through later in the evening. Due to the short daylight hours I did not set off up another hill, instead deciding on doing a bit of sightseeing from the comfort of the Bongo. My destination was to be Calgary bay for the night. 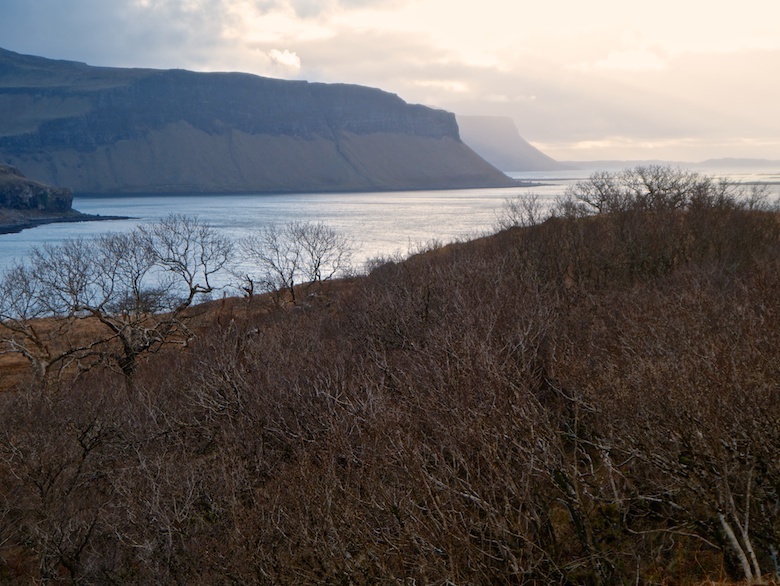 My first stop was to have a peek of the scenery around Gribun, on the northern side of the Peninsular. 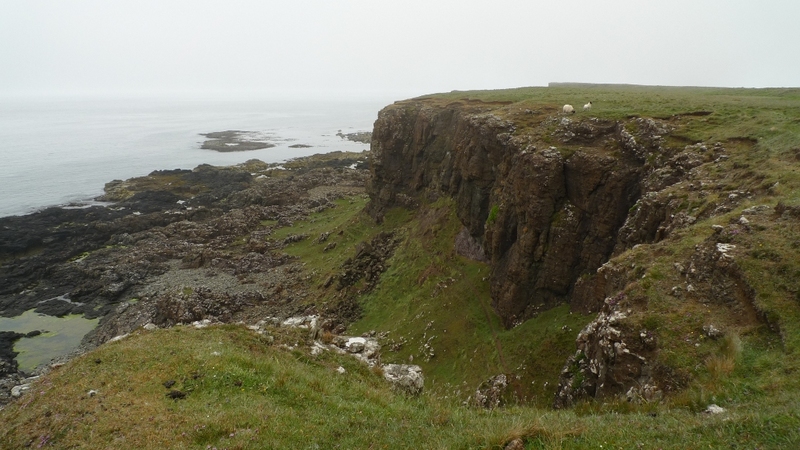 It was as spectacular as I thought it would be, a place to return to backpack around the wild and uninhabited coast past the farm and Mackinnon’s cave. 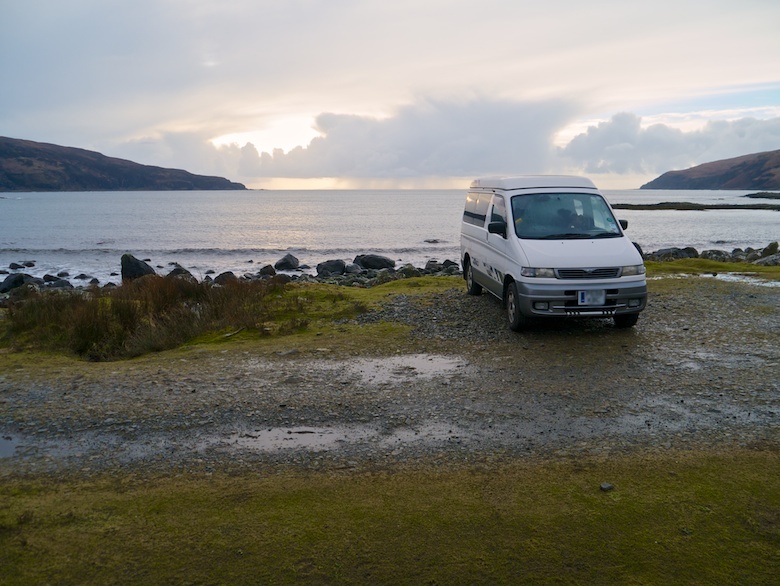 It was a long drive to Calgary as I was constantly stopping along Loch Na Keal, which is a wild van camping paradise as I found out one summer a few years ago. I have to say that I was as disappointed with Calgary bay as on my first visit. Yes it is a perfect crescent of white sand worthy of the tropics. 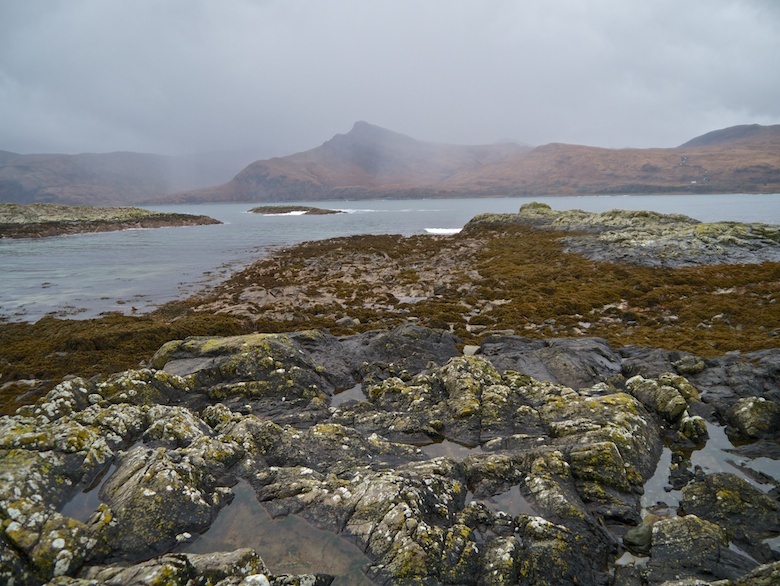 But even on a dull winters day it was crowded, a shock after a few days of almost total solitude on the island. 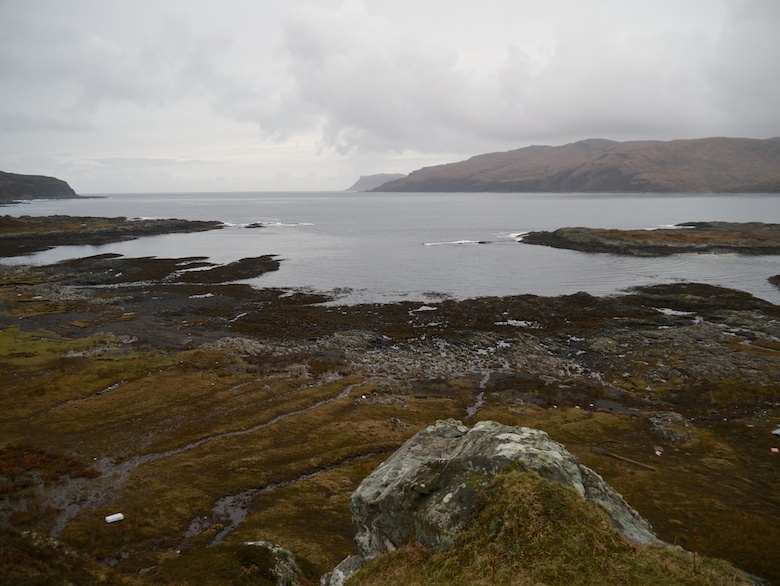 Winter storms have obviously battered the wild camping area, leaving it drowned under rotting seaweed. I returned the way I had come. 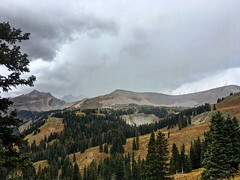 The high point of the road provided the perfect place to stop for the night, an exposed spot when the promised storm eventually rattled through after dark. The storm raged until noon the following day meaning an enforced lie-in (never a bad thing in truth). Reuben was very keen to have a leg stretcher once the sun came out again. A mobile signal showed that a major storm was coming the following day, bang on when my ferry to the mainland was scheduled. The CalMac app on my phone showed various cancellations would be likely. I therefore decided that I would drive to the terminal that afternoon and try to change my ticket. Once again I found myself stopping often to take in the views and the ever changing light. CalMac are much more accommodating than the joke that we have for train operating companies. The guy in charge at the ferry terminal simply asked me to wait in a separate queue until everyone had checked in. After space on the boat was confirmed he swapped my ticket valid for the following day for a boarding pass. Simple. Can you imagine a train company doing that if you turned up for a different train from which you had booked? As is traditional, CalMac fish and chips were enjoyed on the crossing back to the mainland. My New Year plan turned out to be far too ambitious. 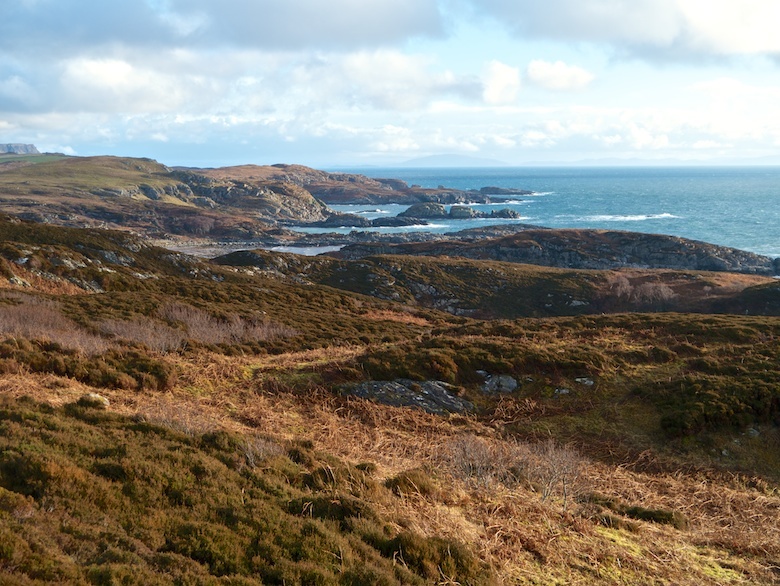 I was going to spend a few nights at my favourite spot on the West Coast of Jura. However the weather once again was not playing ball. After a ten hour drive I would have to catch two ferries, drive another hour and then walk for seven hours. With storm after storm rolling in my enthusiasm quickly diminished. I was still very keen to spend a few days amongst rugged coastal scenery, somewhere to escape the madness of the New Year period. Batteries needed to be recharged after a busy December at work. To make things easier I decided that the Bongo would be both transport and home for a few days. 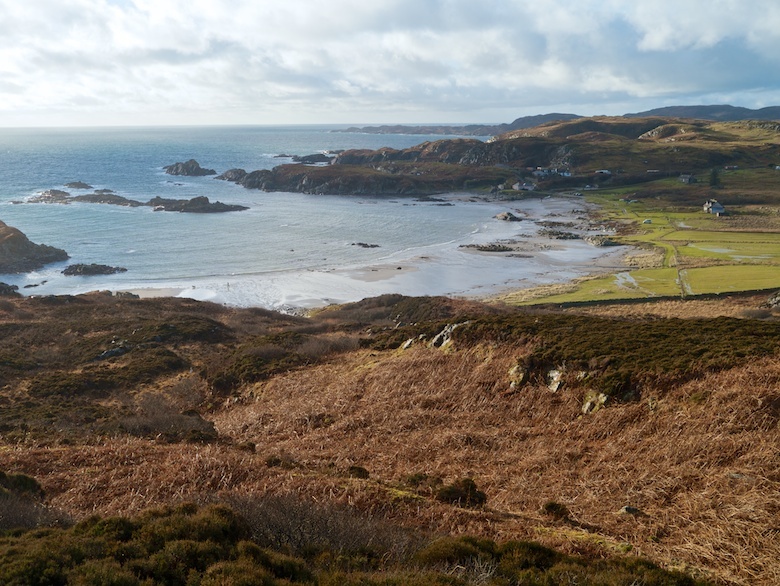 There was suddenly a calm day forecast so I bought a CalMac ferry ticket to the Isle of Mull. I would worry later in the week about the weather on the return journey. There is a 9.45pm sailing on Fridays so I was able to drive up to Oban in a day. In the end it only took nine hours from the Midlands which meant arriving four hours early. The Bongo became a convenient place to snooze that time away. It was far too wet outside to stroll around the town. I found it disorienting arriving on the Island at 10.30pm. The unfamiliar single track road towards Fionnphort was challenging for the Bongo in the dark. Being one of the first off the ferry I frequently had to pull over to let traffic pass me. It is easy to tell when a ferry has arrived on the island as a line of traffic snakes its way along usually deserted roads. Rush hour is dictated by CalMac. I stopped for the night at a small car park near the summit of the road through Glen More. A few stars were making an appearance as I made up my bed. It was pitch black outside when the alarm woke me at 8.00am. This was a bit disorienting as it felt like it was still the middle of the night. 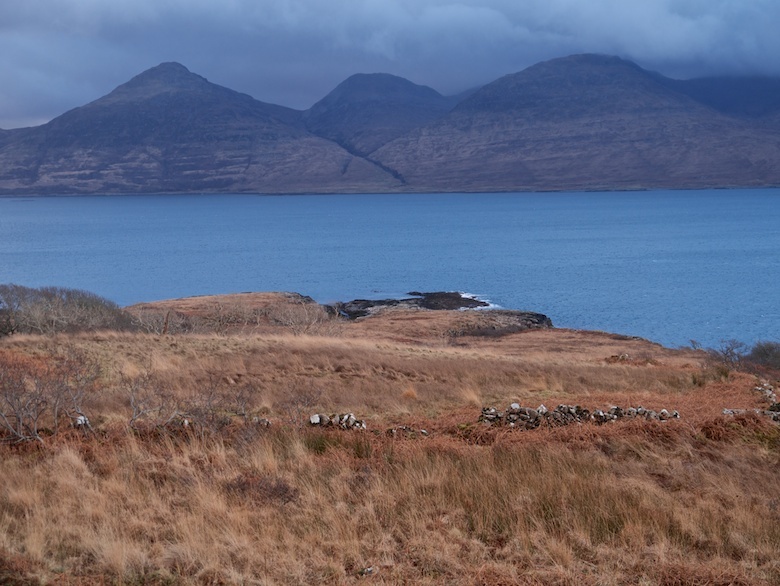 In fact during the whole trip I was surprised at just how short the days were on Mull at this time of year. The sight that greeted me when I finally stepped out the van took my breath away. Arriving at night I had no idea at the view that was hidden in the dark. I visited the Island a few years ago in summer but I had forgotten just how stunning the place is. A few hefty showers passed by whilst I was having breakfast and packing my sack. After they stopped the surrounding hills were covered in a light dusting of snow. 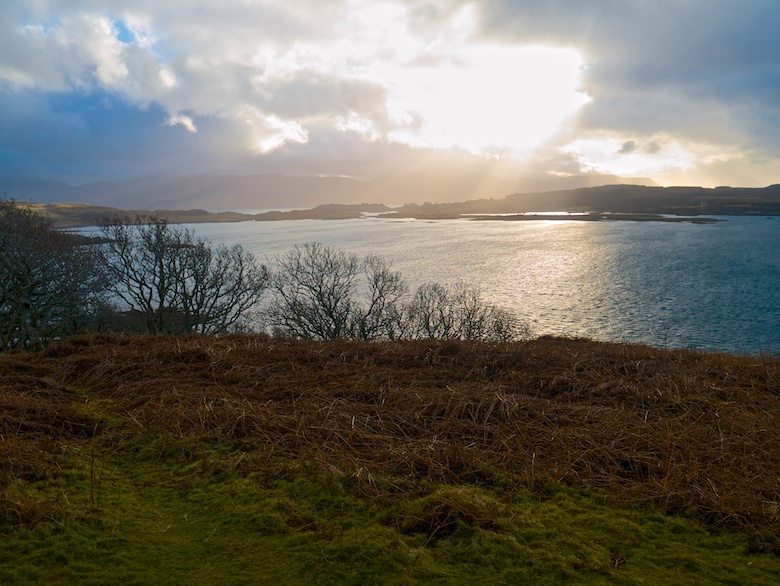 The boiling clouds and rising sun provided a spectacular light show over the lochs to the south. The weather forecast was for a bright morning with little wind before another weather front rattled though in the afternoon. 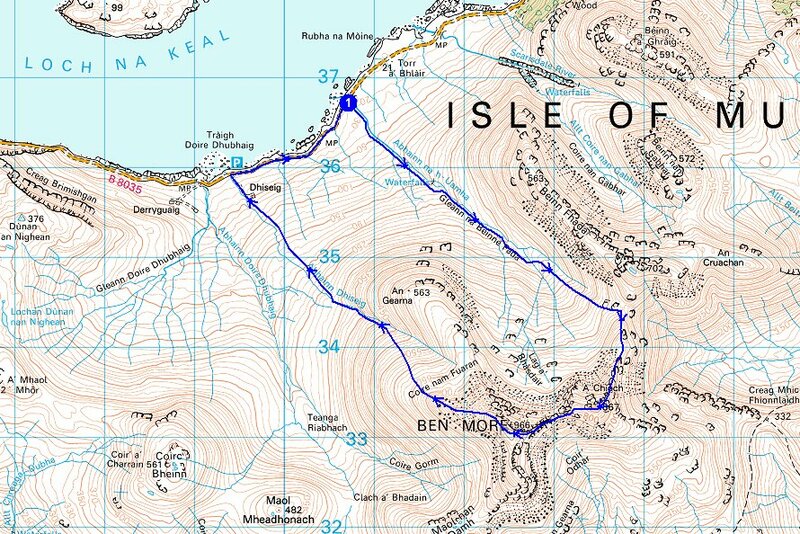 Keen to climb at least one mountain during the week I settled for a there and back walk up Ben Buie. It is a mountain that I admired on my last trip to the island, sadly not having enough time to visit its summit. 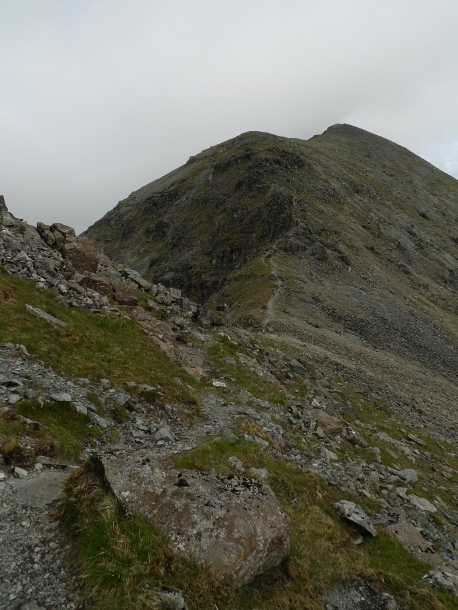 The ascent up its north ridge was straight forward until around the 550 metre contour. 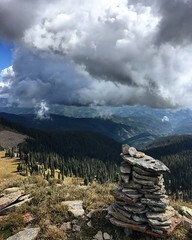 Then out of nowhere the clouds descended, which meant that careful navigation was needed on the wide undulating ridge. Snow was encountered at around 650 metres, just as the rocky slopes of the north peak steepened. This was rapidly melting which meant that there was no point in putting on my microspikes. What would usually be very easy scrambling was a little tricky in the slushy conditions. 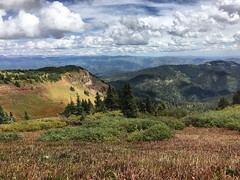 The highest point sits to the south of the summit ridge, the ascents and descents from the north peak appearing much more than on the map. Probably because a combination of mist and snow exaggerates your surroundings. Typically when we were half way back down the cloud lifted and remained above the mountain tops for the rest of the day. Rather frustrating considered we had set off early to get the best of the weather. We arrived back at the van early afternoon, however with darkness falling so early there was not enough time to head off for another walk. 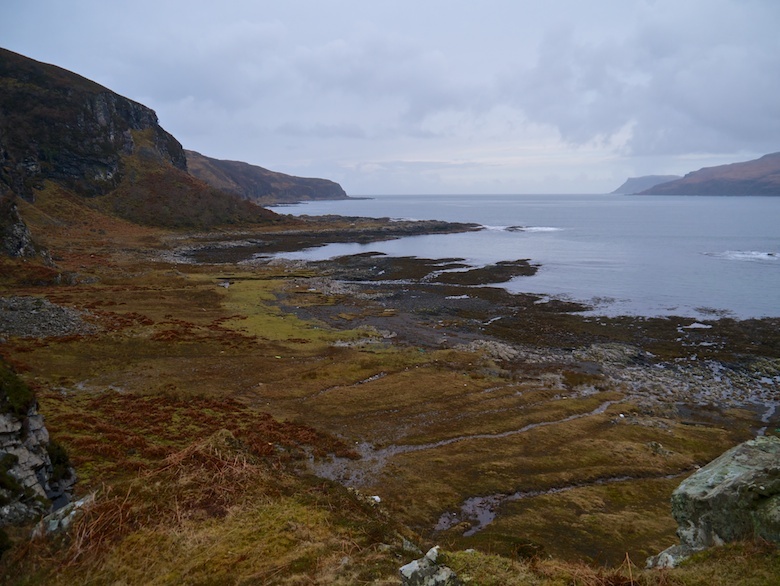 The Bongo was pointed back down Glen More as I was keen to explore some coastal scenery the following day. 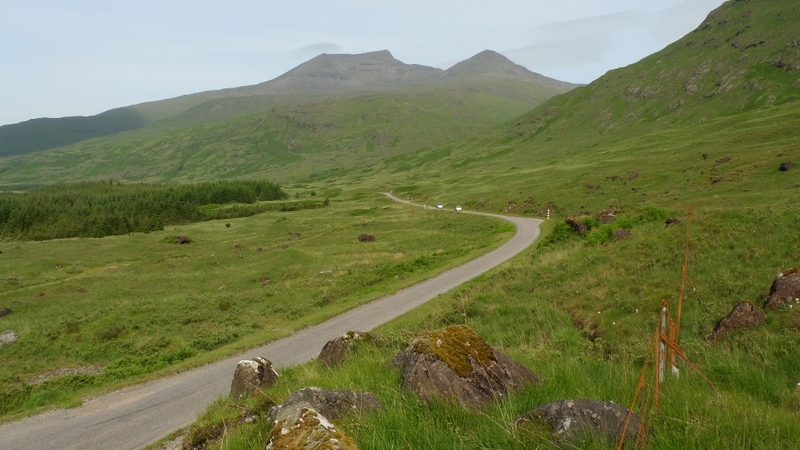 The road to Lochbuie is stunning. Narrow and twisting is ascends steeply through woodland before taking in the northern shore of Loch Spelve. Here the force of the recent weather became apparent with seaweed covering sections of the road. An old yew tree in a cemetery had some of its limbs torn away, scars on its ancient trunk gleaming under a grey threatening sky. The light was fading as I arrived at the small parking area in front of the old post office. 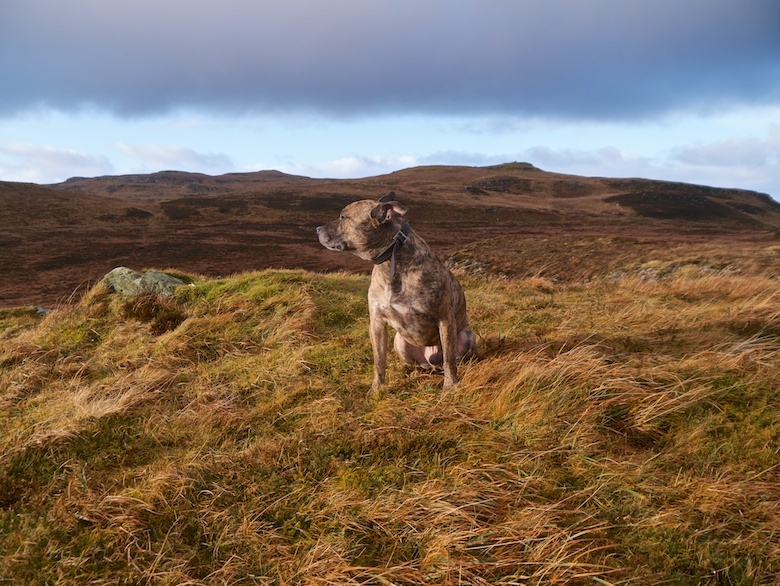 A quick stroll with Reuben before it got dark was an opportunity to stretch our legs as a very long night was in front of us. It was dark by 4.00pm. 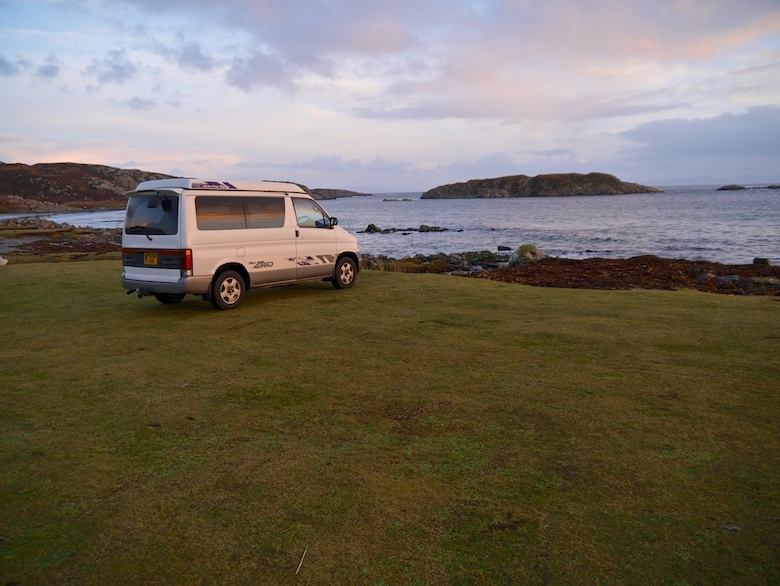 During the evening the wind picked up, rocking the van. I could hear the waves over the drumming of rain on the roof, a comforting sound as I lay in bed reading. A twelve hour sleep was very enjoyable. The wind had died down by dawn, the rain becoming intermittent. 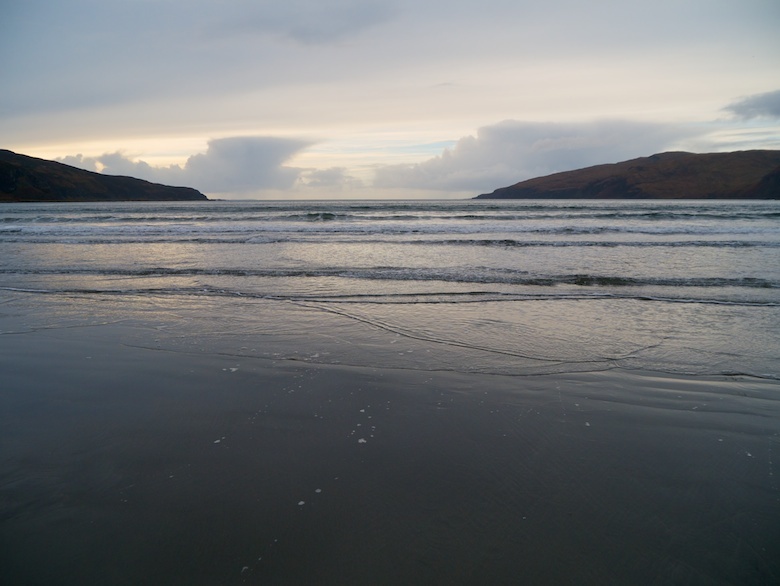 I had no real plans for the day apart from exploring the coast south of Laggan Sands. Several expensive looking 4×4’s passed us on the track to Lochbuie House. As we walked in front of the grand looking building it was evident that people were gathering for a shoot. A collection of Barbour, tweed and gun dogs. Soon after going past Moy Castle the peace was shattered by a cacophony of shotgun blasts. 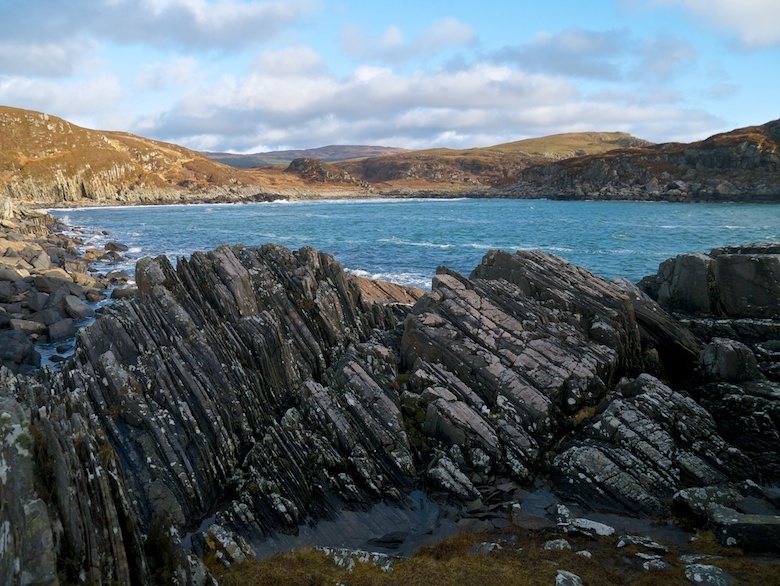 We only ended up walking a couple of miles beyond Laggan Sands, I took my time as the coastline was absolutely stunning. I cursed leaving the binoculars in the car as I spotted two White Tailed Eagles circling overhead. One even doing me the favour of perching on a small island a few metres offshore whilst I was having an early lunch. Back at the van it was tempting to stay for another night. However being surrounded by houses I was not fully getting my ‘wild’ fix. Before leaving I visited the local shop which is located in what was the old post office, a small wooden shed like structure. 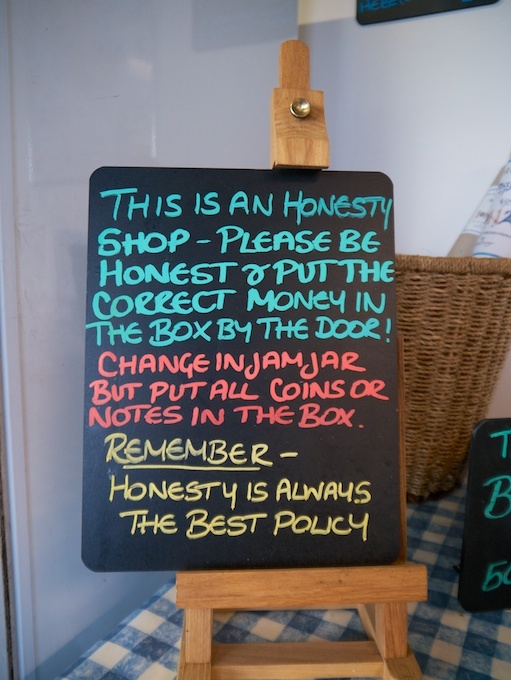 This is not staffed and relies totally on the honesty of visitors to leave the correct amount of money. Having places like this exist left me with a warm feeling as we drove off in the Bongo to find another stunning spot. Ok now that is not the most snappy of post titles but it does do what it says on the tin. Anyhow I was originally going to call it ‘Cruach Choireadail, Beinn a’ Mheadhain, Corra-bheinn and Cruachan Dearg from Teanga bridge’ but you may have nodded off before you even got started. I had spent another rather peaceful evening and night in the Bongo even though the main road had moments of very heavy traffic. There seemed to be a pattern which involved a couple of hours of pretty much nothing then all of a sudden there would be a convoy of about 50 vehicles stuck behind a caravan. I have a funny feeling that these bottle necks were the result of a ferry docking and then everyone finding to their dismay that a caravan got off the ferry before them. Anyway I revelled in the fine sunny weather which extends pretty much into the middle of the night. I even heated up some water out of the river and got myself smelling a bit fresher. As usual the rather attractive bit of grass I had parked next to was a tick metropolis, but being in the van meant that I did not have to commune with them. They really do like hanging out together, some areas have none whilst others are infested. What you can count on is the fact that they usually like that cropped nice tent sized piece of grass that you fancy erecting you tent on. The one that probably had some tick infested deer having dinner a little while before. This is one of the main reasons why I have always favoured tents over tarps and sometimes a campervan over a tent. Anyway this is the last of the Mull days out, I need to get a bit quicker on the write ups. 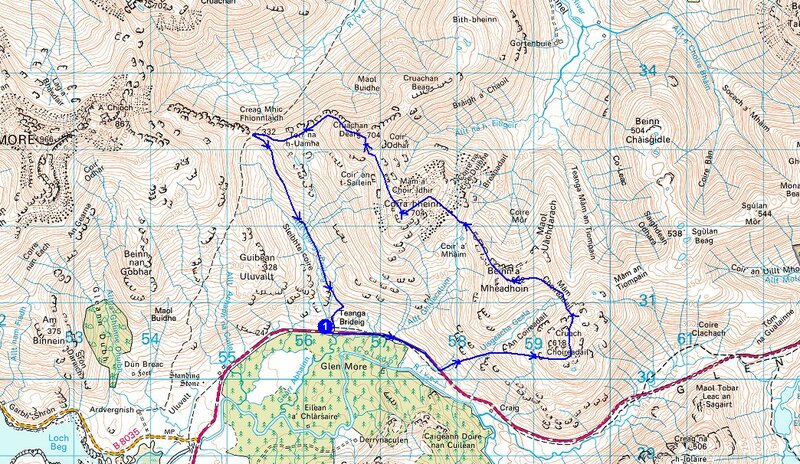 I have to admit at being a little bit disappointed at finding out that this walk was less than 8.5 miles as it really was a tough day out. I spent a fair few days feeling a little tender and it goes to show that you should count the contours after cobbling together a mountain route. 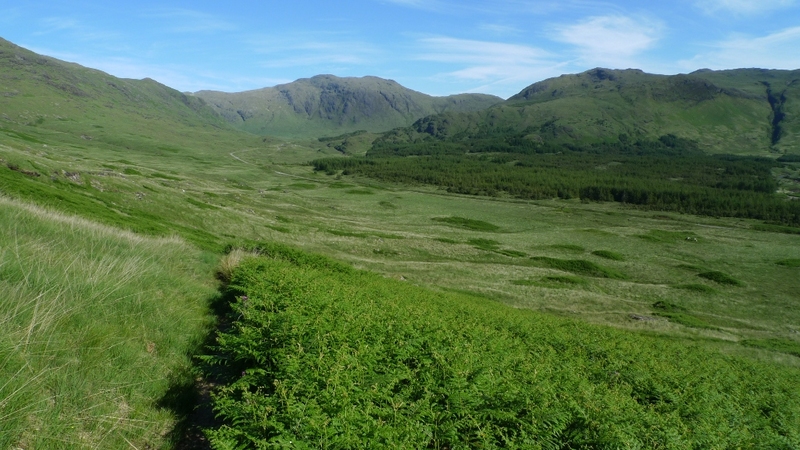 It was hot already when I set off up the main road through Glen More, although this main road was single track. Somewhere between the Allt Ghillecaluim and Uisgeacha Geala I left the security of the road, climbed a steep bank and hopped over a rusty fence. Already Ben More was dominating the view and would only appear bigger throughout the day. All that I can say is that this section was steep and very rugged in terms of vegetation. After reaching the 150 metre contour I can remember thinking to myself I had climbed a considerable height until the illusion was squashed when I checked the altimeter on my watch. 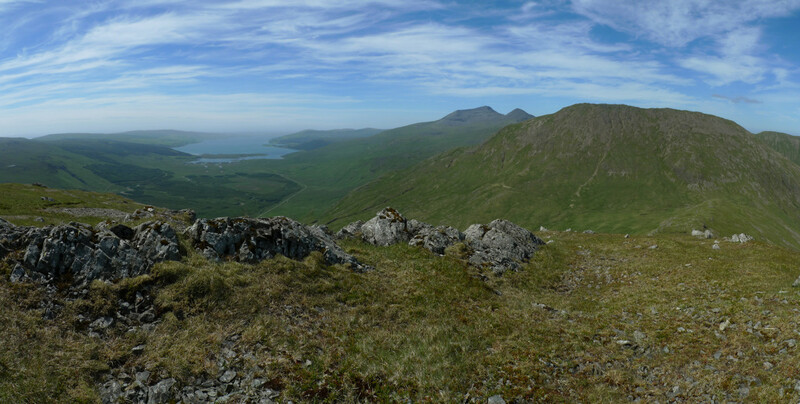 The view opened up to Ben Buie which I had failed to climb on my first day on Mull. 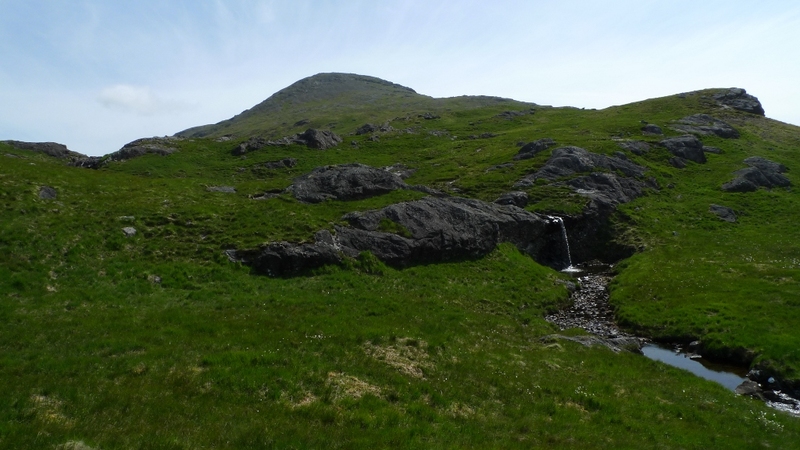 The 300 metre contour brought an easing of the unrelenting steepness and I was on course for the stream at a pleasant little waterfall. 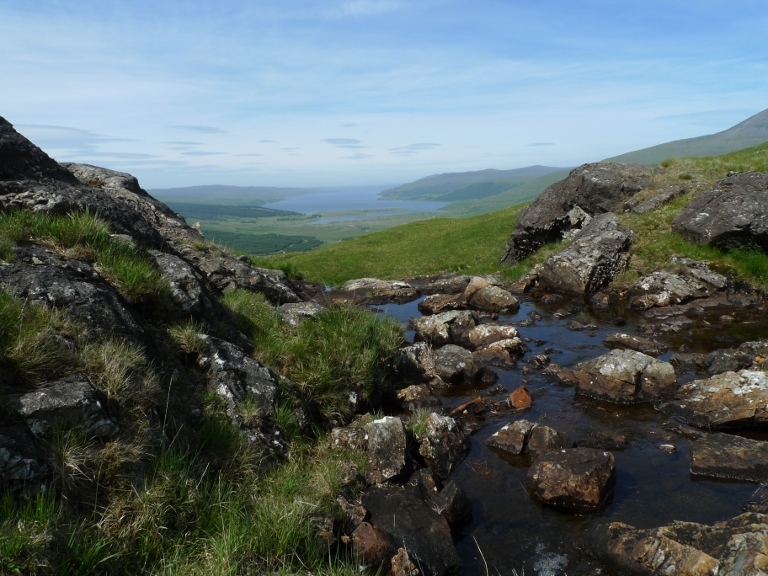 It now felt really hot and I sat at the top of it, filling up my water and wetting my cap in the cold clear water. 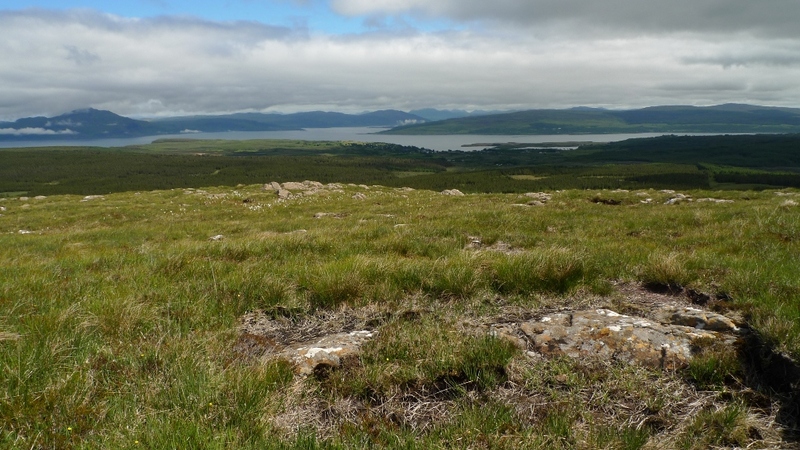 With some altitude under my belt the climb to the summit of Cruach Choireadail was not too bad and the vegetation was now composed of short rough grass. For a ‘small’ mountain the views from the summit cairn were pretty extensive. Ben More dominated much of it but there was a great view down the entire length of Loch Scridain and the Ross of Mull. 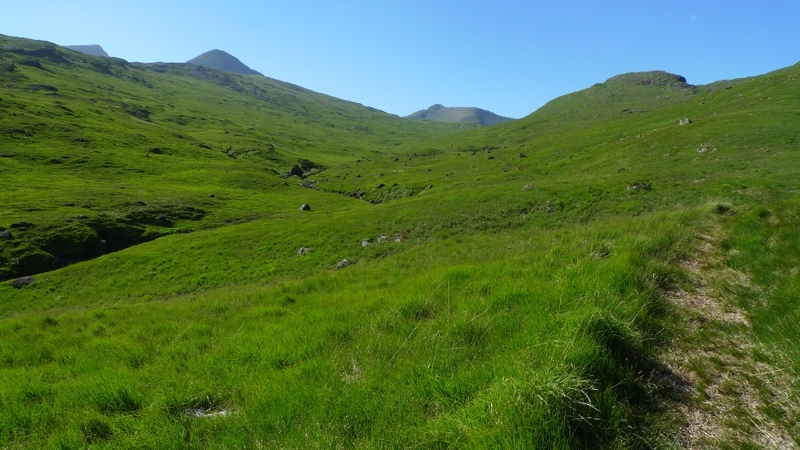 My next aim was for the pass of Mam Choireadail, contouring and bypassing Cruachan Beag. Not exactly a huge drop but enough of a descent to get the leg muscles working. 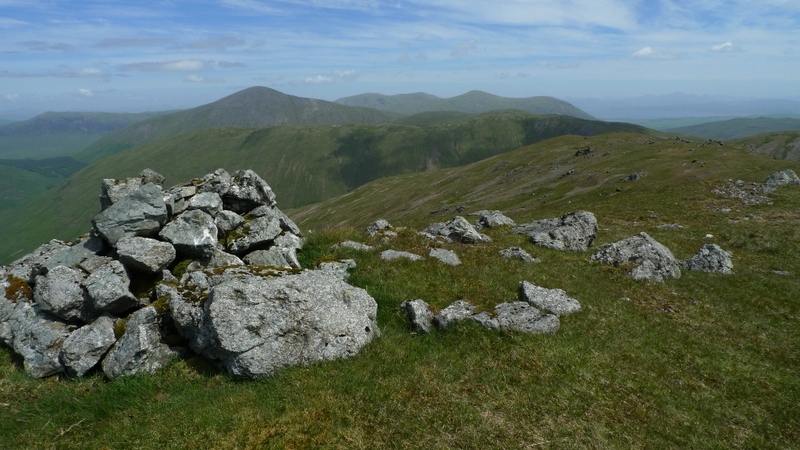 The climb to the summit of Beinn a’ Mheadhain was on easy grass and the small cairn gave more big views, pretty much the same as from the last summit but with a slightly different perspective. I was not even at the magic 2000ft but I definitely felt like I was on the summit of a mountain. Just below the summit cairn there was nice grassy space against a blocky boulder where I wedged myself in to eat lunch. I decided that I should move on when my eyelids started to get heavy! 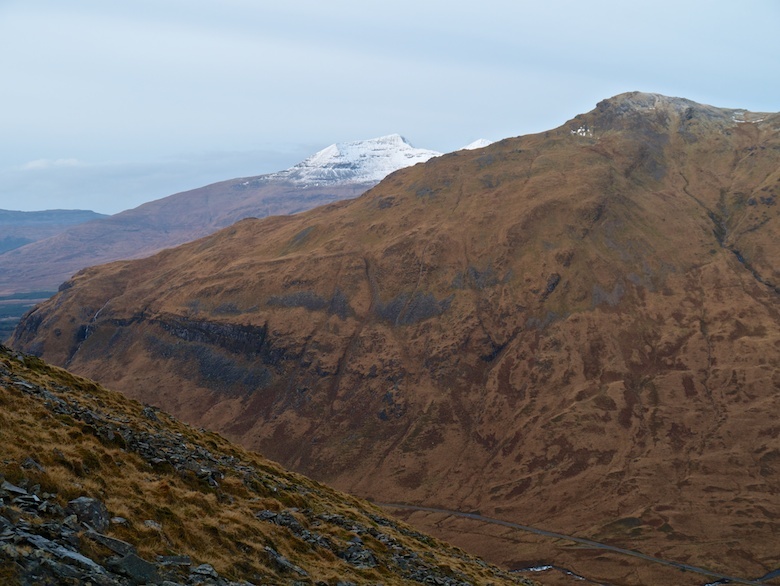 As I was leaving the summit I noticed a figure approaching from the distance, for me this sort of spoiled the feeling of wildness and isolation! 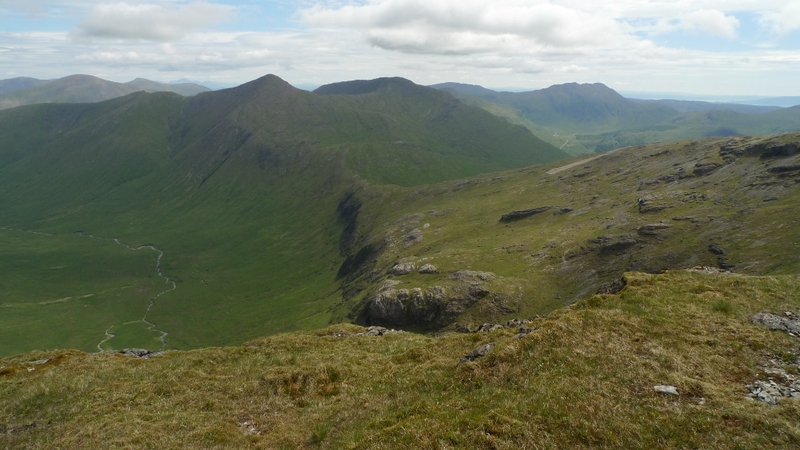 I started the descent towards Mam Bhreapadail and really started to regret not counting the contours whilst planning this walk. 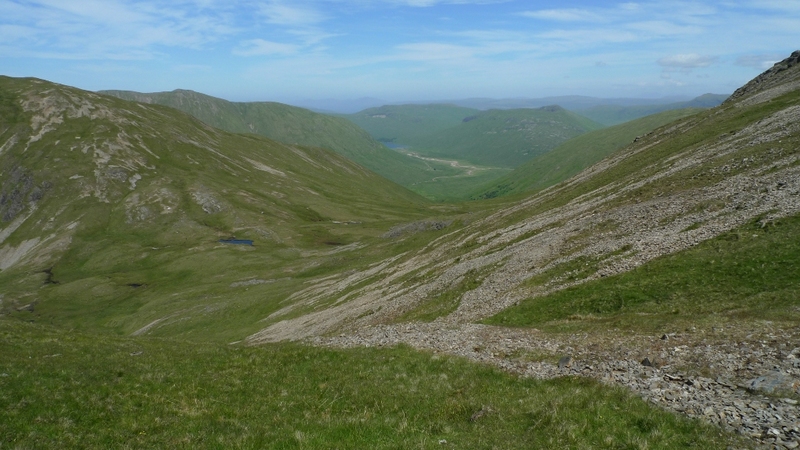 The pass lays at 390 metres and the mountain ahead rises to 704 metres, a pretty big descent and re-ascent! At the bottom of the pass the slopes of Corra-Bheinn appeared even steeper and I headed for a ‘nose’ like ridge that sticks out of the main slope. 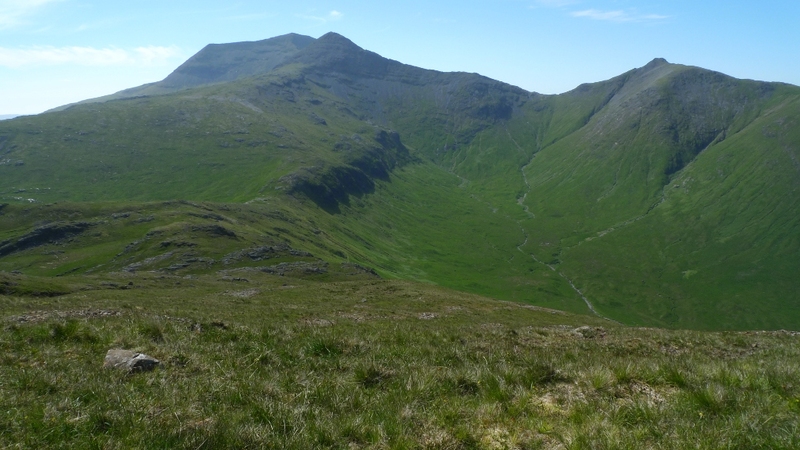 The climb however was worth it and leads to a pleasant ridge where Ben More is framed perfectly between the twin peaks. 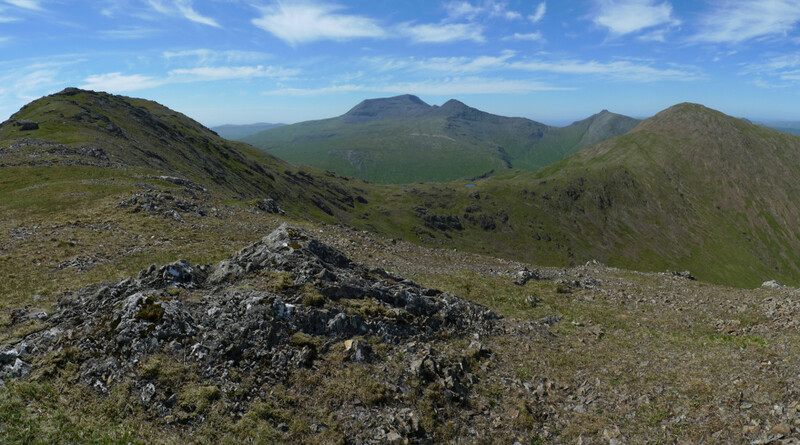 The summit of Cruachan Dearg is a perfect cone and the approach from Corra-bheinn makes it appear steeper than it actually is, from here the view across to Ben More is breathtaking and you can appreciate what a beast of a mountain it really is. It’s just a shame that the weather was not as good when I climbed it a few days previously. 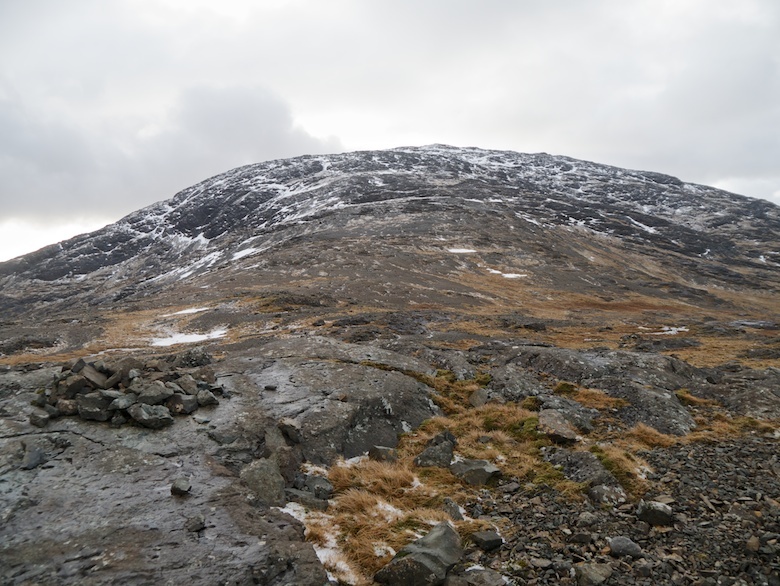 As I dropped height down to Carn Cul Righ Albainn a gusty wind appeared out of nowhere and I had to remove my cap to prevent it being blown off my head. A herd of red deer were watching me nervously from a distance before suddenly deciding that I was simply too dangerous and legging it off into the distance. At the col a feint path continued in the same direction heading for the summit of A’Chioch, although I could not work out how it would ascend its steep summit cone. 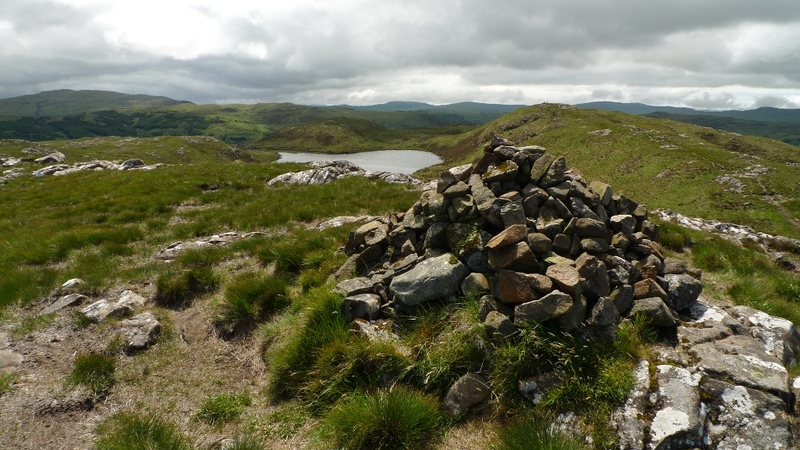 I instead turned left at the large cairn and started the descent into the valley of Allt Teanga Brideig getting one final glance up at the summit I had just descended off. I was struck whilst descending just how green the grass was, I am not sure what word describes a green that green and this photo really does not do it justice. The colour was absolutely stunning, a colour I have never before witnessed whilst out in the British hills. 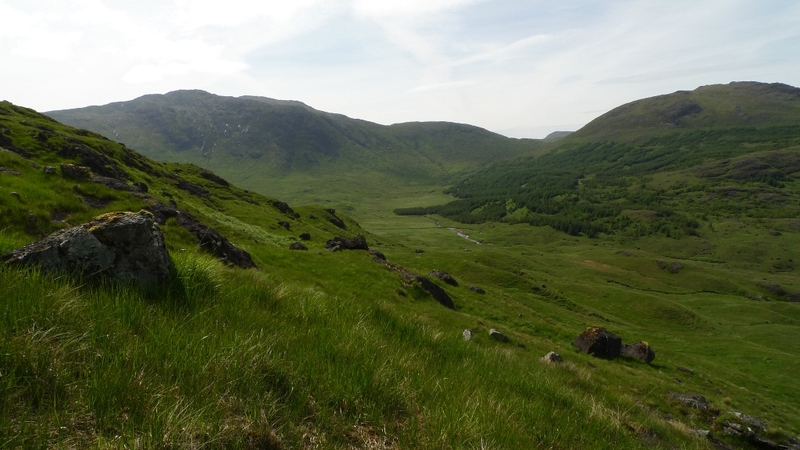 The path soon brought me out into the wide Glen More with a lovely late afternoon view up the valley. I could see the Bongo not that far below, I was tired but at the same time wanted to drag out the time I had in the mountains. 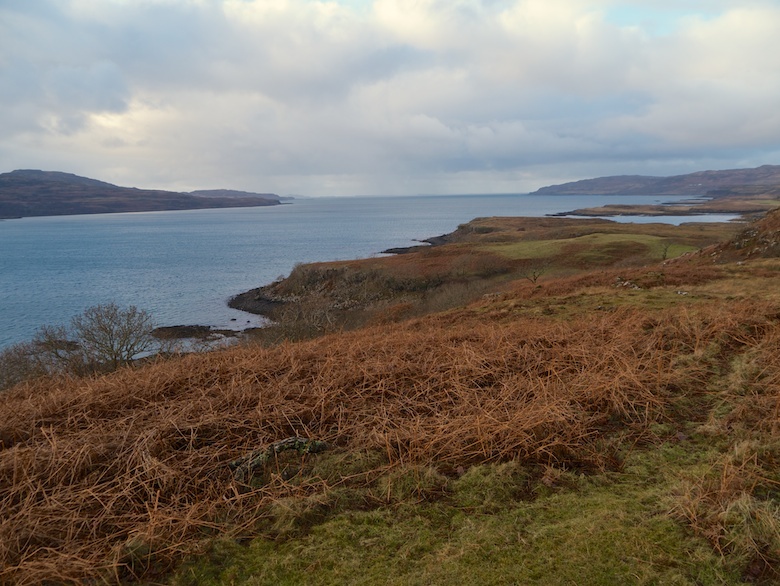 Today was my last day on Mull and I would be sad to be heading off onto the mainland and the long drive home. 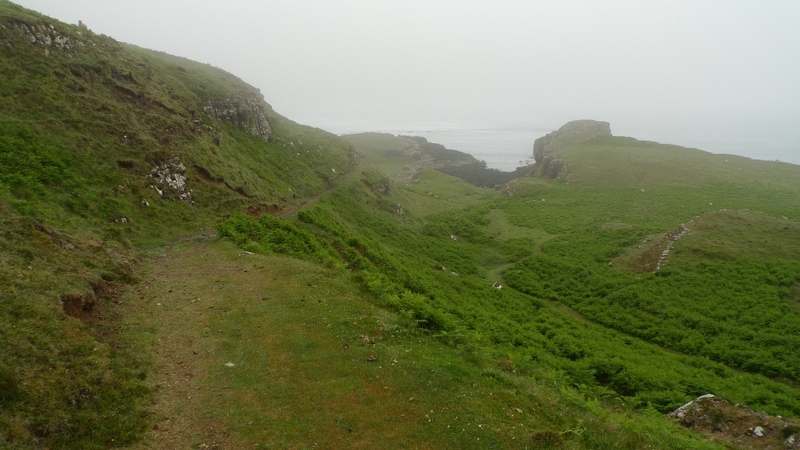 There was still much more fine walking to be done on the Island and I had only just scratched the surface. 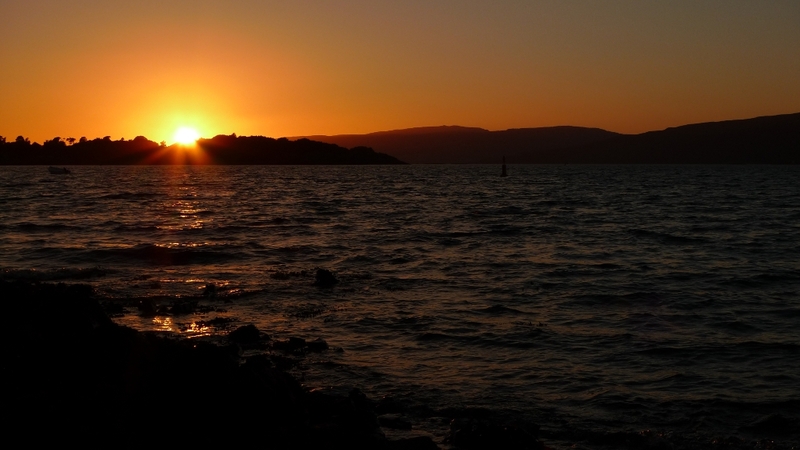 That evening whilst at the campsite at Craignure I was treated by one of the finest sunsets that I have seen outside of India, the horizon was on fire. What a fine way to remember an outstanding week on Mull. The following morning whilst queuing for the Calmac ferry back to the mainland a member of staff let me know that the ferry had blown up and all reservations had been cancelled. The replacement was much much smaller and it would be first come first served. Unfortunately the mountain weather forecast was spot on. I awoke to a dull grey world, the cloud gently drifting just above the van. I really did not think that cloud base could be this low and I was left wondering what I could do considering that pretty much everything on the island would be invisible today. I gazed across the sea loch at the cloud capped north shore and decided that a coastal walk was in order, at least there was a chance that the cloud could lift a few metres and I would not be totally enveloped. The single tracked ‘B’ road that leads to Calgary bay probably has some of the most spectacular views as it twists and winds its way across the west of the Island. All the time it is climbing and falling with hair pin bends and the occasional steep drop down to the sea hidden in the mist. 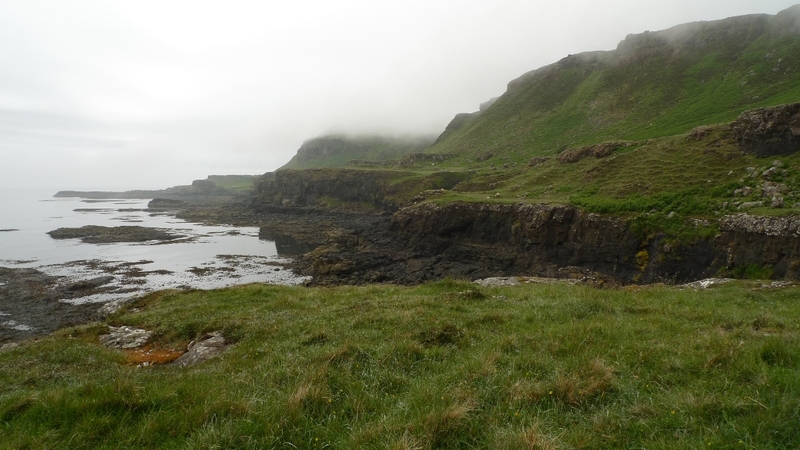 The south shore of Loch na Keal although very cloudy had been dry, this part of the Island was very damp with the mist being composed of a fine drizzle. I parked up the Bongo in a disused quarry just before Ensay and had a quick debate as to whether I should wear a waterproof or not. It was very warm and muggy and I had to decide if I wanted to get wet through sweat or wet through the fine damp mist. I decided that it would be more comfy getting wet from the outside. 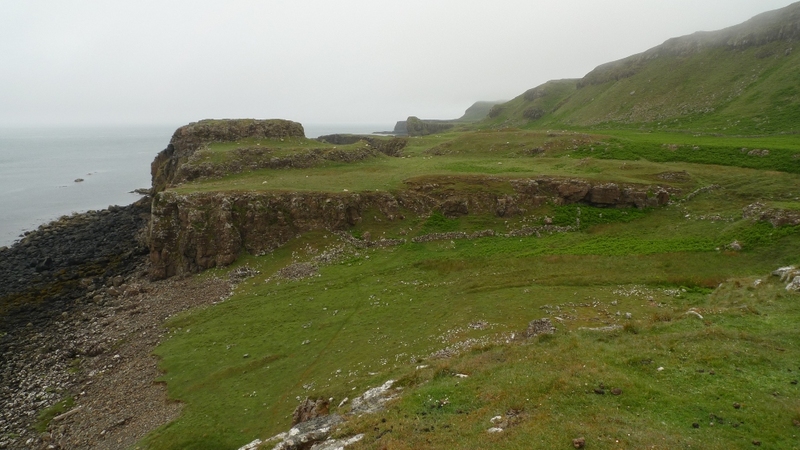 A track crosses the Ensay Burn and heads towards Treshnish cottages, most of which appear to be available to rent as holiday homes. 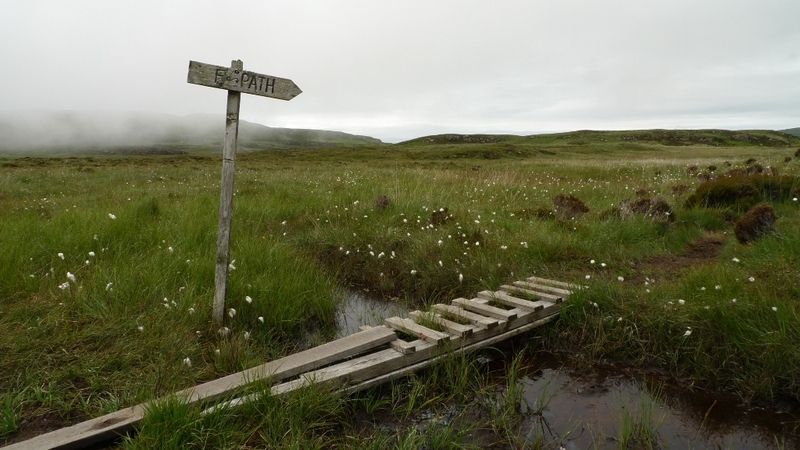 I really could not see very much at all as I joined the track onto open country and almost considered turning back as the combination of no views and muggy dampness was not filling me with the joys of summer. I decided to continue and passed Haun cottages which are located around 2 miles from the road. 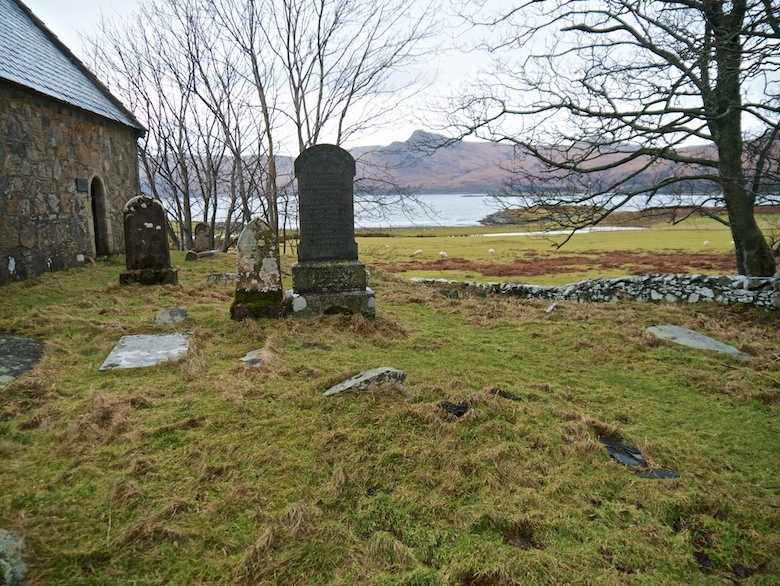 These are also holiday cottages that can be rented and are in a lovely remote location. I can’t vouch for their views because there still was not one. I was only 60 metres above sea level and firmly still in the clouds! A short distance later a gate led to a lovely firm cropped grassy track and an actual view of the coast below. I followed the coast for a couple of miles taking time to explore all of the nooks and crannies, the landscape was exceptional. At times I would walk above the cliff tops at other times I would be on the sea-shore. There is no one defined way to go, simply pick and choose. 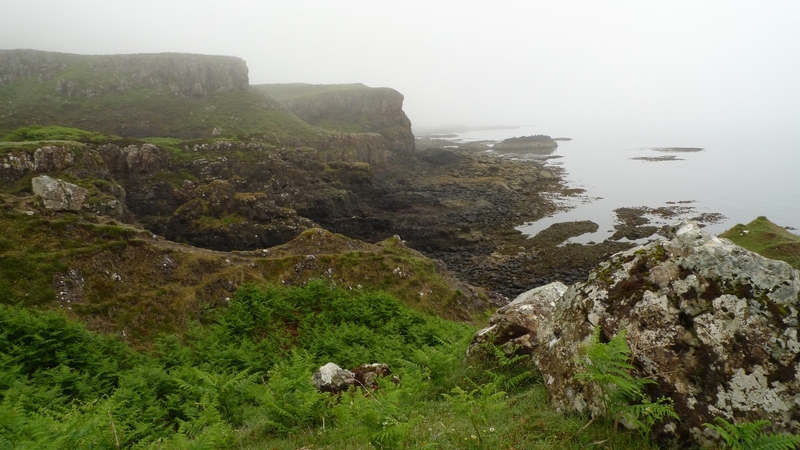 Every now and then the cloud would lift a few more metres giving more of a view out to sea where I could make out the Treshnish Isles on the misty horizon. 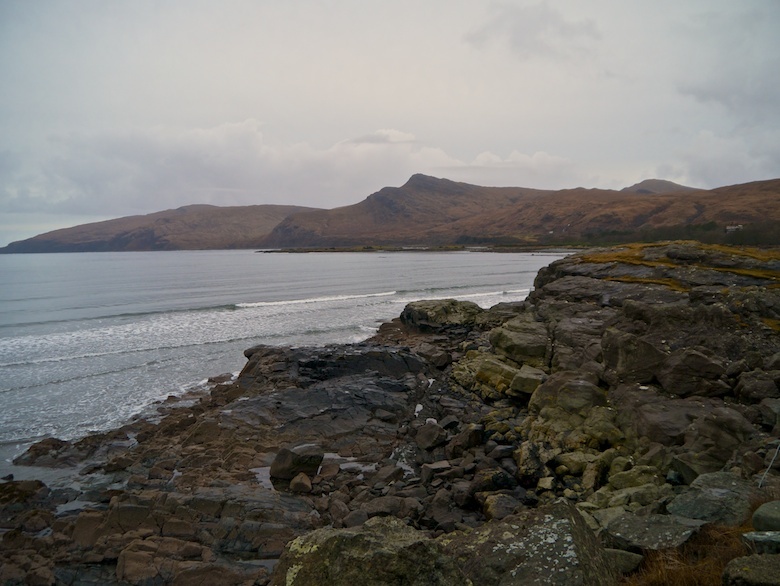 The photos below give a flavour of the coastal landscape along this part of the Mull coast. I decided to go and hunt out the ‘Whisky cave’ that the OS map fails to mark. A bit of scrabbling around contouring above some cliffs and I found it just below a rocky gully. From above it did not look that spectacular and I could not be bothered with scrambling down greasy looking rocks to explore its innards. 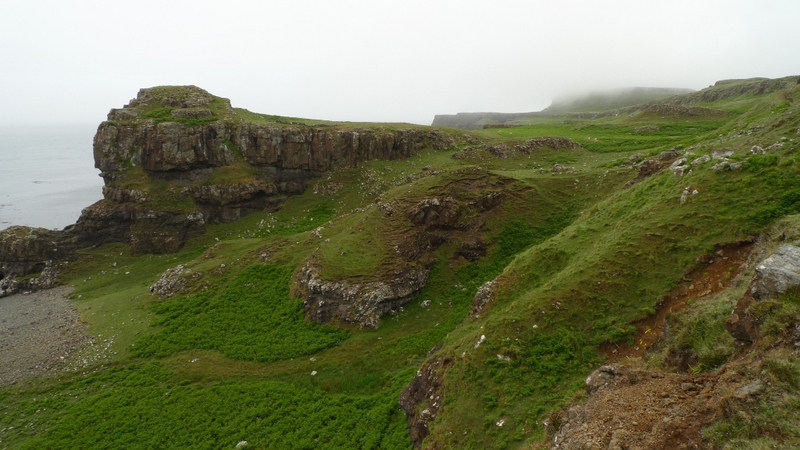 However the clouds did lift enough for a moment to give a great view to the north with the second tier of cliffs becoming visible. 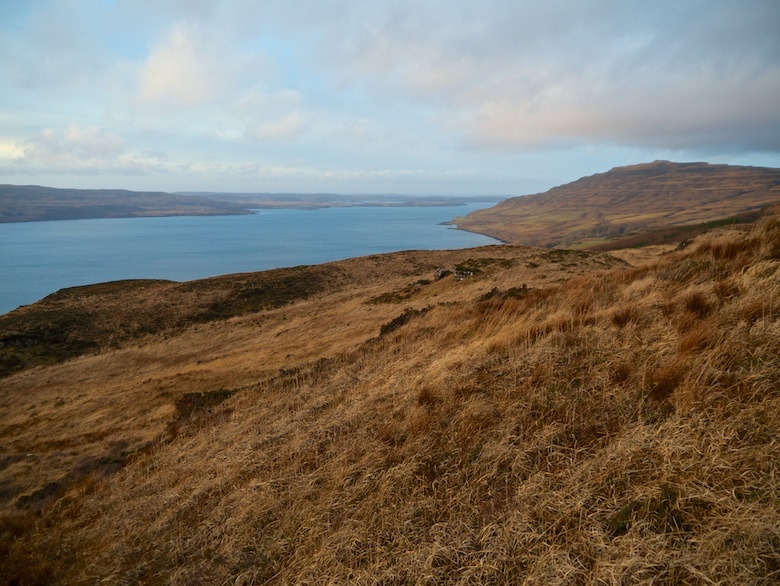 My next objective was the deserted village of Crackaig perched high above the coast on the moorland above. As I left the coast and was walking inland I looked back out to sea and spotted something sticking out of the water. It quickly disappeared and then reappeared further along the coast. It was triangular in shape and it was then I realised it was a large fin. I really regretted not having binoculars with me. I watched for a while as it circled around in the shallows before noticing that there was a smaller fin like shape a few metres behind it (a tail fin?). Whatever I was watching was definitely large and it soon attracted the attention of a boat that started to circle it. I sat and watched the boat watching the wildlife and fancifully decided that it could be a basking shark. 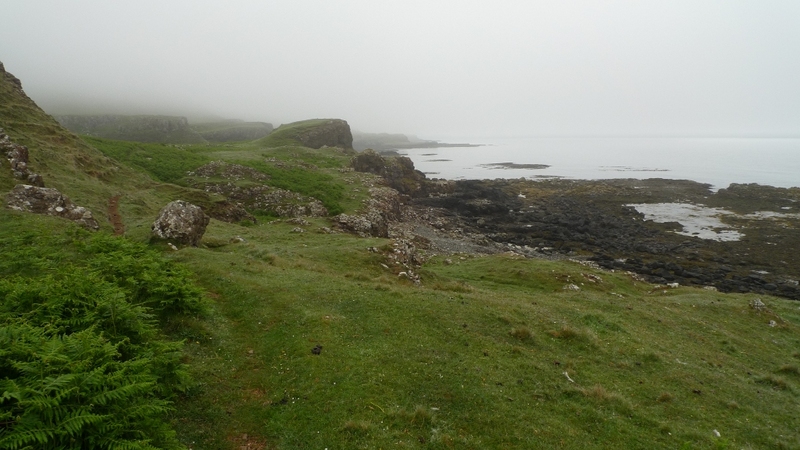 I soon got bored of watching a distant fin so began the steep climb along a zig zagging path to the deserted village. An erie spot with well preserved houses scattered among the misty moorland. Higher up the path crossed a boggy plateau where luckily there are wooden planks to cross the deeper more smelly sections. The path goes around the back of a cottage with a great big view and onto its driveway. Stomping along something caught my eye and I stopped to notice a small adder a few feet away. I fumbled with my camera and approached a little closer to try and get a photograph. In response I got a hiss before it quickly slithered off into the heather. It was not as keen as the slow worm a few days earlier to be photographed! Anyway it was then a quick and easy walk along the road to the waiting bongo, as usual as my walk was drawing to a close the cloud had finally lifted and was now sitting at a pretty lofty 200 meters. 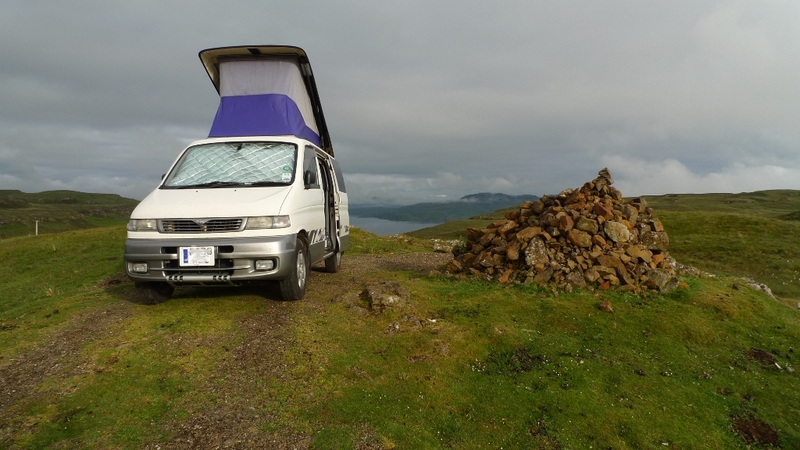 I now had another decision to make, where to spend the night in the Bongo. Any old spot would not do, I wanted somewhere special to park up for the night. Somewhere quiet and with big views. I had read a lot about Calgary bay which has a white sandy beach and a designated ‘wild’ campsite. Being just round the corner I decided to Bongo on down and have a look. Spectacular it was but the campsite was a bit too crowded for my liking and rather spoilt by giant motorhomes. Time instead to go off and look for my own patch. On the misty drive earlier on in the day I had noticed a cairn at the highest part of the road with space for a bongo next to it. It turned out to be a lovely spot, especially when the sun came out in the evening and the views returned. Another peaceful undisturbed night followed. 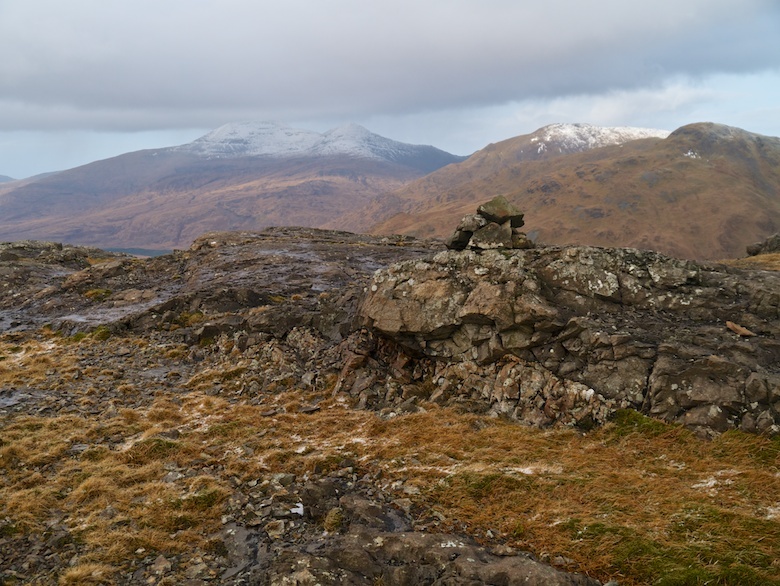 Some days even very keen hikers would rather just chill out and look at the scenery rather than get muddy within it, this was one such day. It’s just a shame when such days occur when the weather is looking much better. During the last couple of days I had been craving fish and chips and I thought that if anywhere on the Island would sell fish and chips it would be the capital Tobermory. 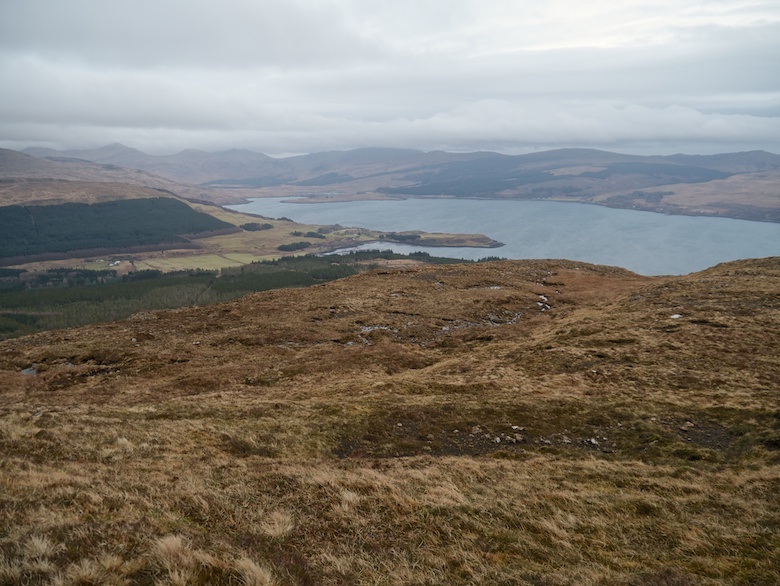 After a lie in I decided that I would head to Tobermory for a late lunch via a short walk around the extinct volcano ‘S Airde Beinn. 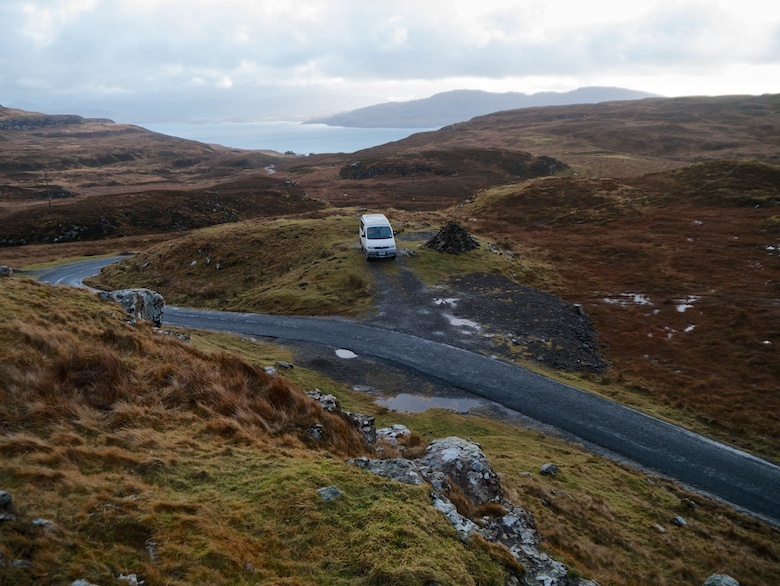 As usual the driving on Mull was driving at its best, very narrow roads with hair pin bends. They would be much better if there was no other traffic but I did not mind stopping every now and then to let people pass with such good scenery to look at. 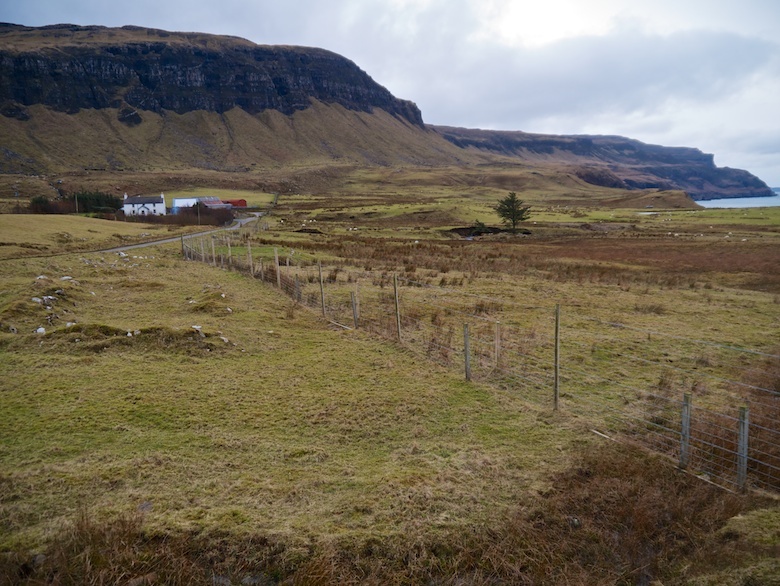 Between Dervaig and Tobermory there is a succession of lochs, the middle one Loch Meadhoin has a ruined cottage next to the road where there is space for a couple of vehicles to park. 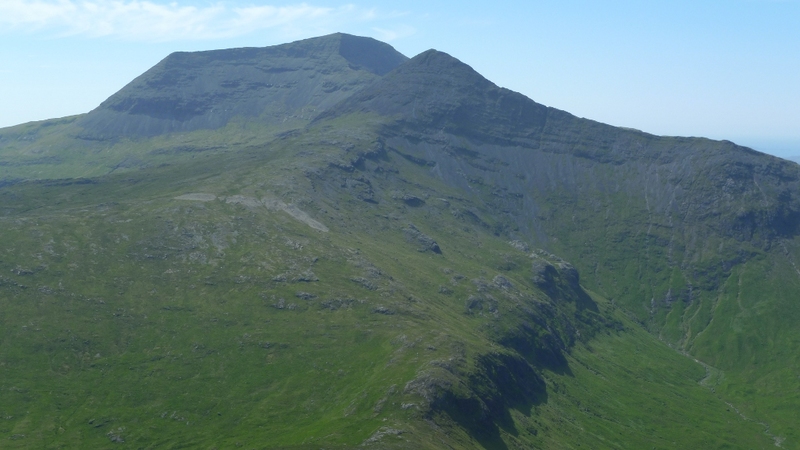 ‘S Airde Beinn is a volcanic plug with a crater in the middle of it and although not particularly high at 292 metres it is meant to have the best view on north Mull. A simple walk it was too, it was only when I was half way up that I realised I had left my map in the van. No worries, you just follow the path up to the hill directly ahead, then clockwise around the crater. 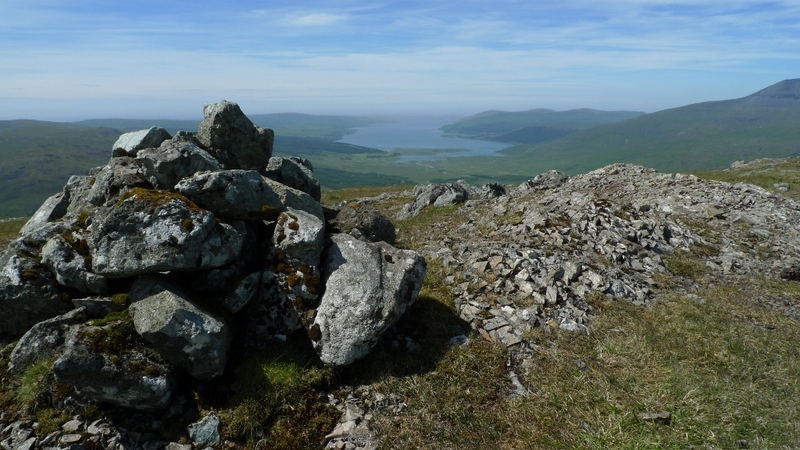 You could be up and down in less than an hour but I sat at one of the cairns for a while and drank in the views. I wished I had remembered to bring binoculars to Mull as there were a few people up there watching something I could not see! It was then food time in Tobermory! Famous for the children’s programme Balamory the town in picture postcard pretty. However for me I found the village rather bland, it is the sort of place that has no ‘real’ shops just ones selling tourist crap. Being midweek it was not particularly busy but the people milling around were of the very slow, browsing at shops selling crap variety. Not really a place for someone in dirty clothes who is just beginning to turn fragrant! Anyway I cursed the lack of a fish and chip shop and consoled myself with fresh bread in the local Co-op. I like the Co-op in principle but local experience in Nottingham shows that they are completely incapable at manning a till successfully. We usually have 6 members of staff stacking shelves and one flustered one at the till with a huge queue. People usually get cross and storm out, sometimes bad words are used. It was the same in Tobermory, it must be company policy. It transpired that the chip shop is a van hidden behind the war memorial. Pleased I filled my belly and moved on. I took the long way round to Glen More where I parked up next to the old road by Teanga bridge. A lovely spot surrounded by mountains, the following day was going to be a hot leg wobbling epic! I was pretty keen to escape from the domestic confines of the campsite in Craignure. 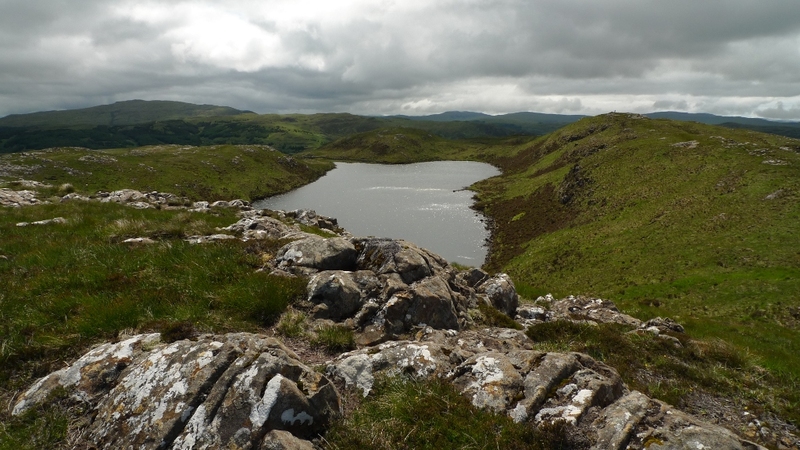 My plan was to spend the next three nights ‘wild’ camping in the van with days spent comfortably striding across the hills in brilliant sunshine whilst being caressed by a gentle breeze. 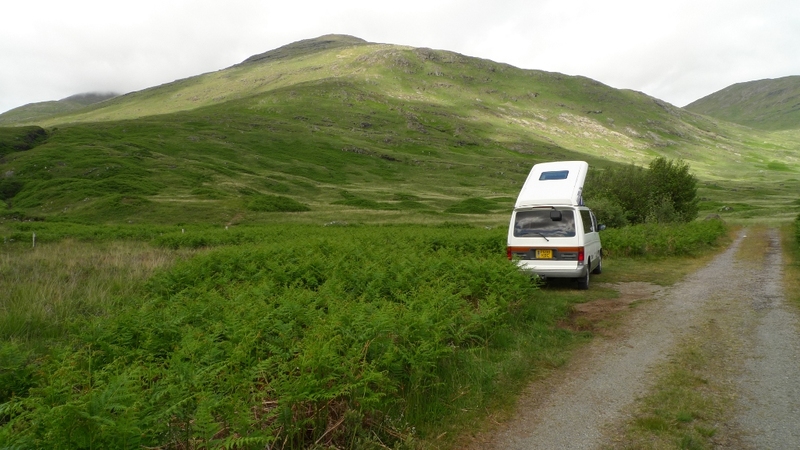 I managed the three nights camping wild in the van bit which was nice, but the days were either spent staggering up hills or stumbling across damp misty hillsides, all the time in a hot sweaty mess. 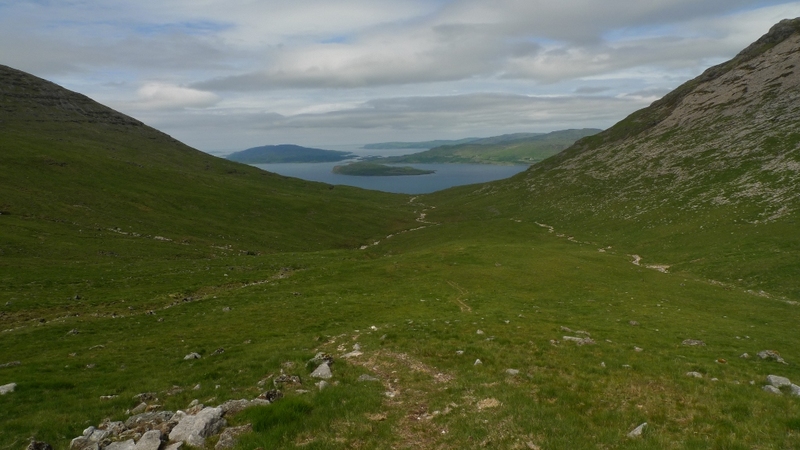 The word striding is a word that does not accurately describe how I hauled by arse around Mull. 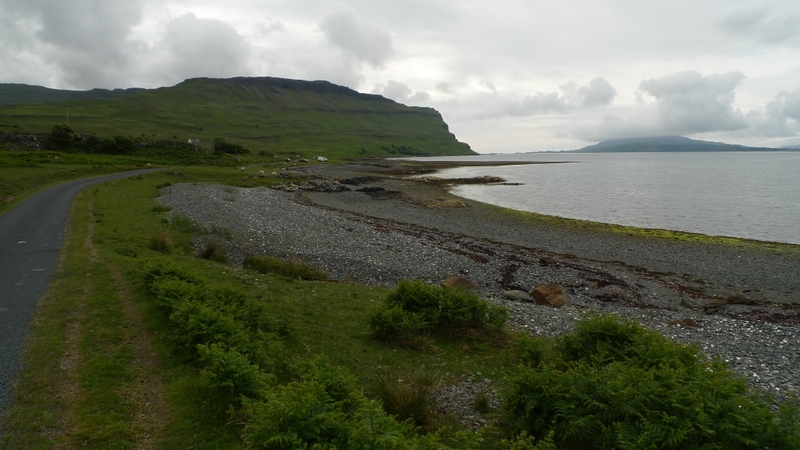 In terms of mileage the south shore of Loch na Keal is not that far from Craignure, but it does take a fair while to reach. 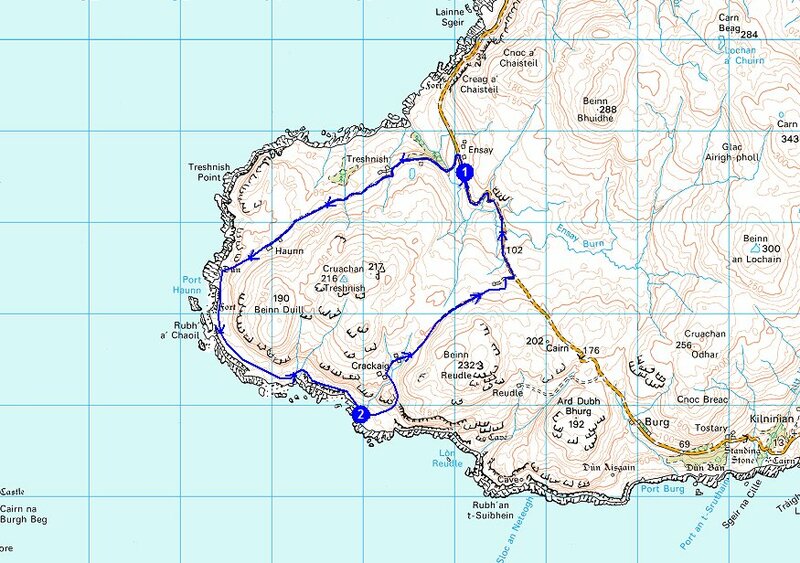 For one the scenery is rather special and secondly most of the roads anywhere on the island are single track. This means frequent stopping to let another vehicle pass. In some ways it is nice because you get to wave at every passing driver, but it gets annoying after a while. And then you get the odd driver who ignores single track road etiquette and blasts past you in a swirl of dust and gravel with a stoney face and no sign of a thanks. Some people eh? 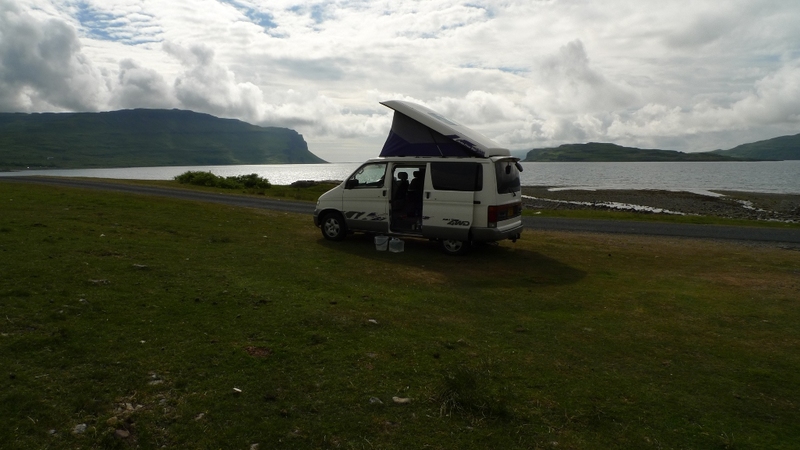 I parked the Bongo next to the Abhainn na h-Uamha on the other side of the road from Loch Na Keal. 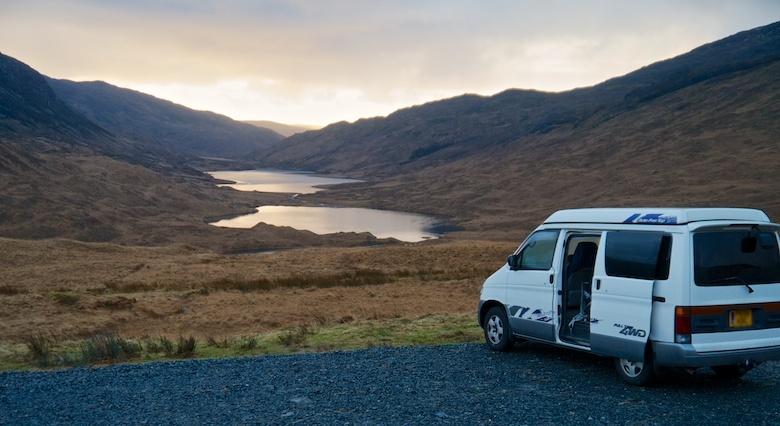 A superb spot amongst spectacular scenery and one which I had decided that I would spend the night. As usual I was aware that it was getting late in the morning, I wanted to get to the summit of Ben More before promised low cloud came later in the afternoon. As I set off from the van I felt a mixture of excitement and apprehension as today according to guidebooks was going to include a spot of scrambling and a little exposure. I very rarely venture onto terrain that involves using hands as I am more often at home backpacking across bleak open spaces. 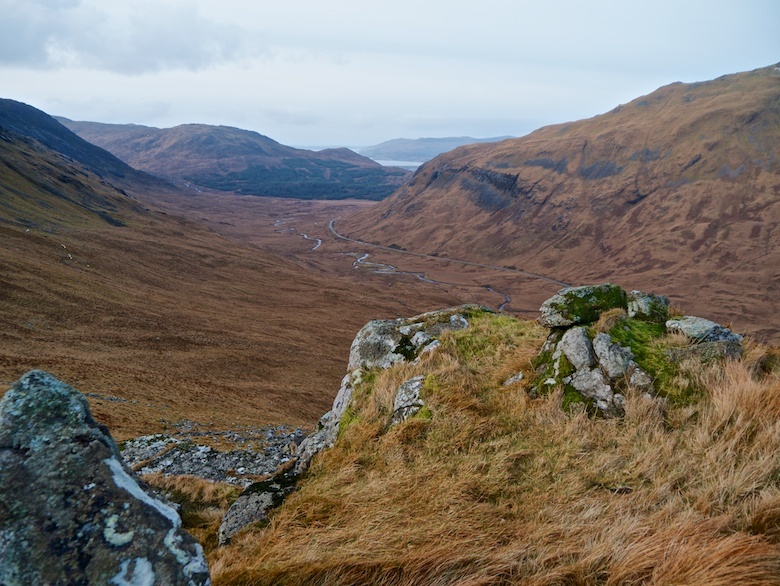 I was therefore not sure what to expect as the description of the A’Chioch route varies so much, this shows how subjective any route in the mountains can be. All I really knew was the fact that Ben More is a big hill and I had to climb all of it as I was starting off at sea level. A path sets off along the right bank of the river at a gentle gradient, the river itself disappears into a shallow gorge within a short distance. 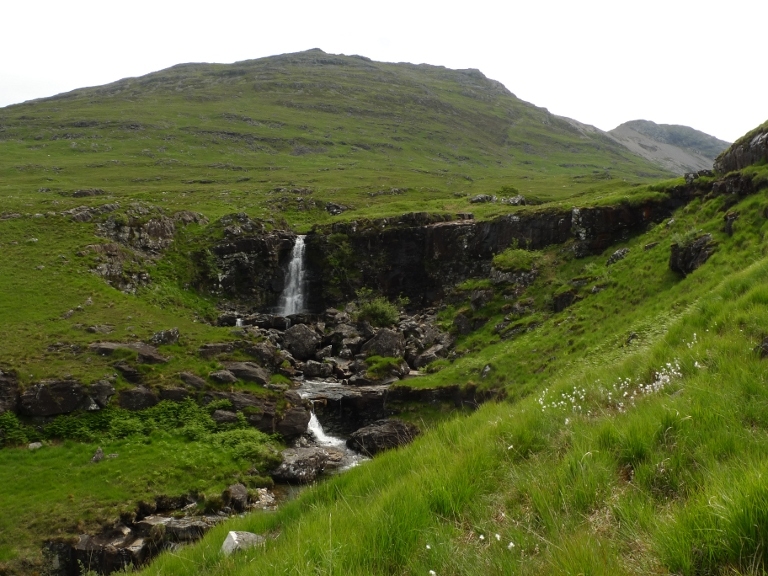 After about a mile the contours gather closer together and a waterfall appears with Beinn Fhada as a backdrop. 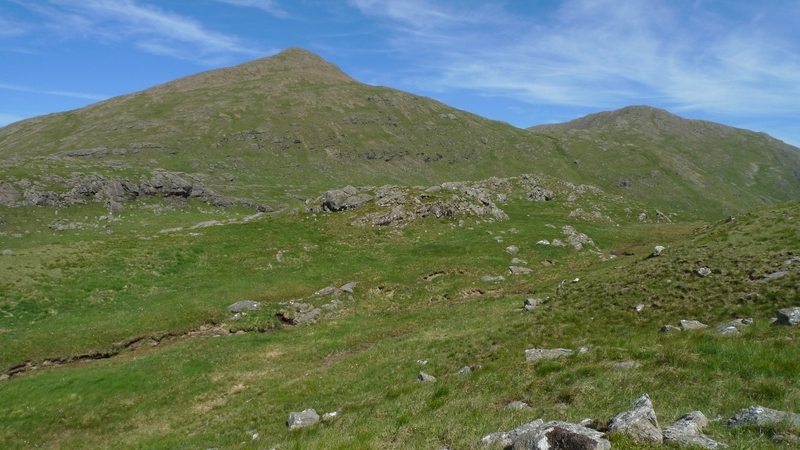 I had spotted the narrow summit cone the day before whilst walking the Dun Da Ghaoithe ridge, it looks like it would make a great round if tacked onto Ben More. However although still sunny it looked like the promised cloud was lining up on the horizon. Time to try and summit Ben More and get a cloud free view. It’s a long slog up through the valley and I would imagine under most conditions would be pretty boggy. However the ground was dry and the bogs had a bit of a crunch to them. The only hindrance was the muggy heat and some very determined horseflies once again. Once the 300 metre contour is reached the path becomes steeper as it climbs to the head of the valley. 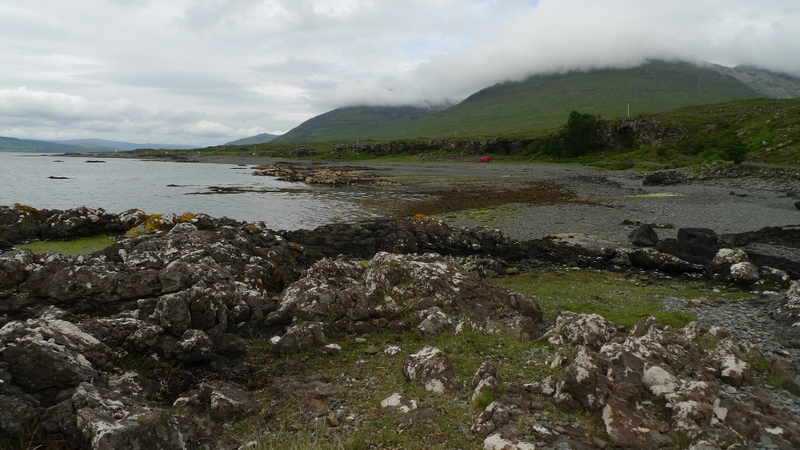 The view back is through a perfect V to Loch na Keal with Eorsa and Ulva providing an Island background. 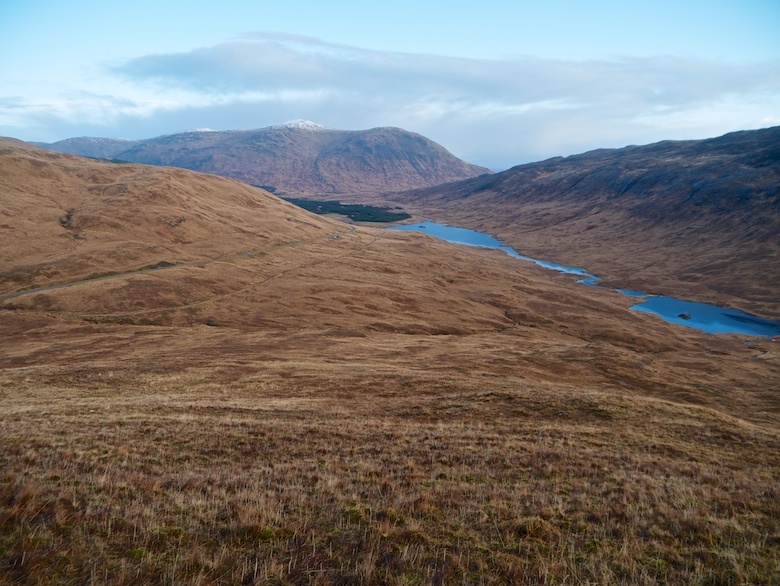 A’Chioch (to the left) and Ben More also start to dominate the view across the Coire. 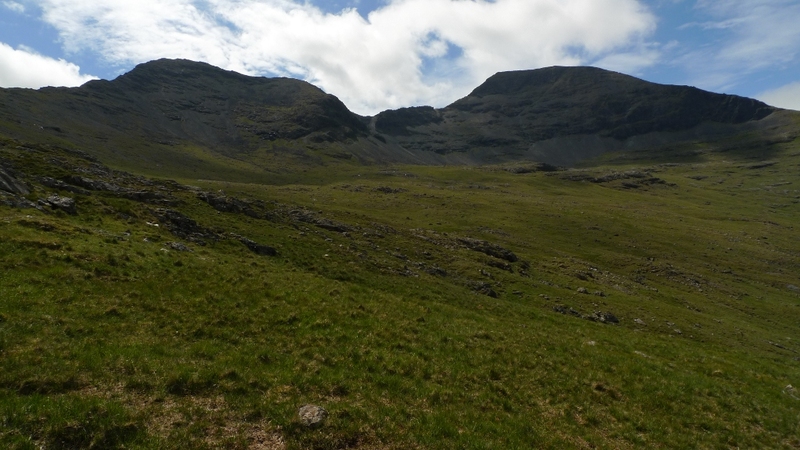 It was with some relief that the bealach between Beinn Fhada and A’Chioch was reached. Although at less than 550 metres I felt that I was now up in the mountains. 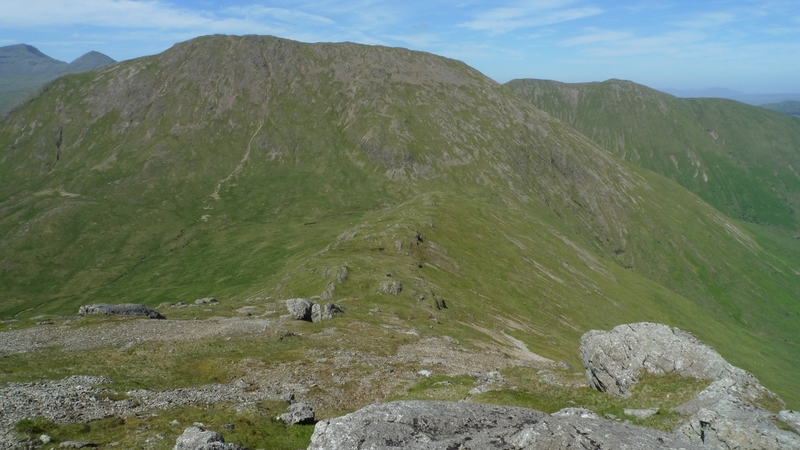 The steep north ridge of A’Chioch was ahead of me with tiny figures scrambling up its rocky spine. 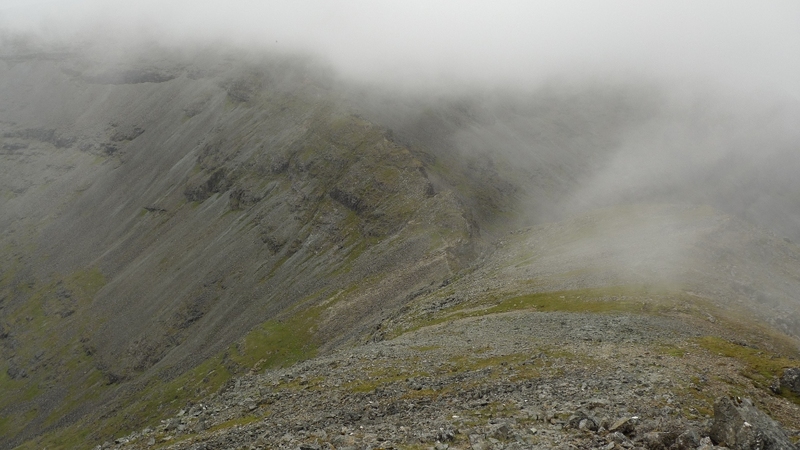 Unfortunately the summit of Ben More started to pierce the lowering cloud base. 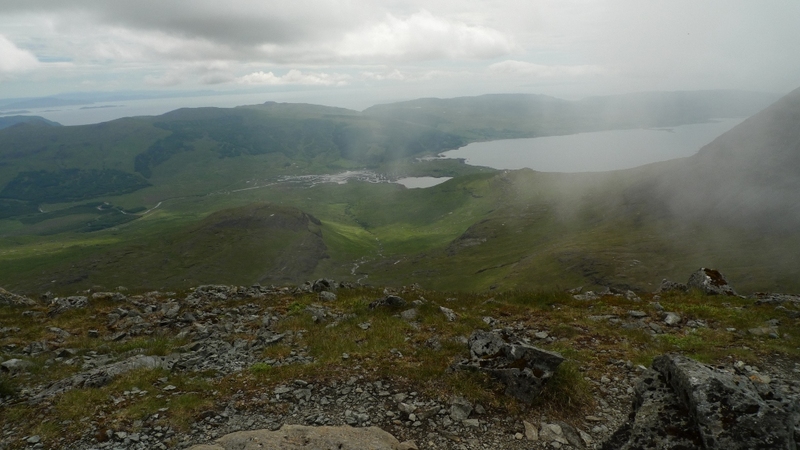 However to the south and east it was still sunny and I could see the route I would be taking in a couple of days across the pointy peak of Cruachan Dearg. 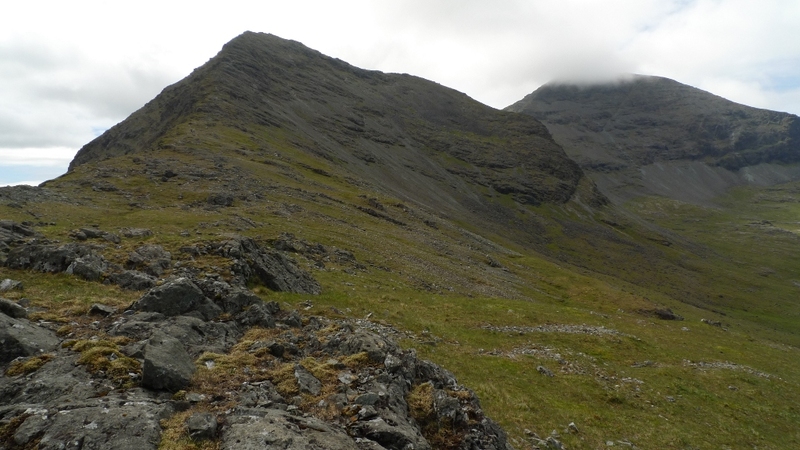 Beinn Fhada soon began to shrink in size as I made rapid progress up the increasingly steep ridge. 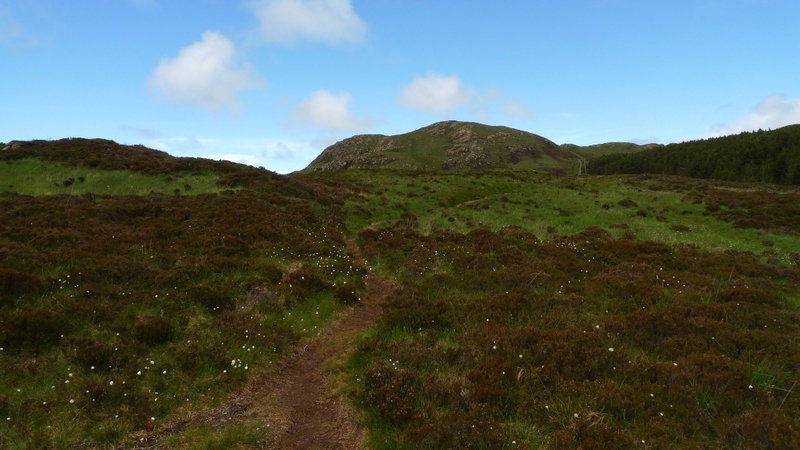 This was beginning to become hill walking at its best. Towards the top of A’Chioch hands need to come out of your pocket, although there is no scrambling in the real sense. 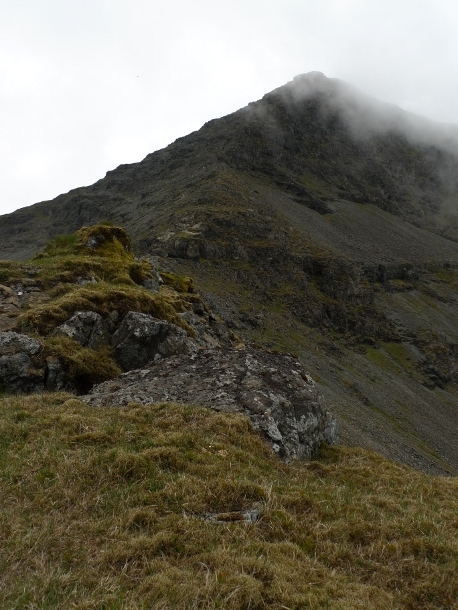 The ridge does become quite narrow but before you know it you are perched on its narrow summit. The cloud suddenly came out of nowhere almost blotting out the ascending ridge. 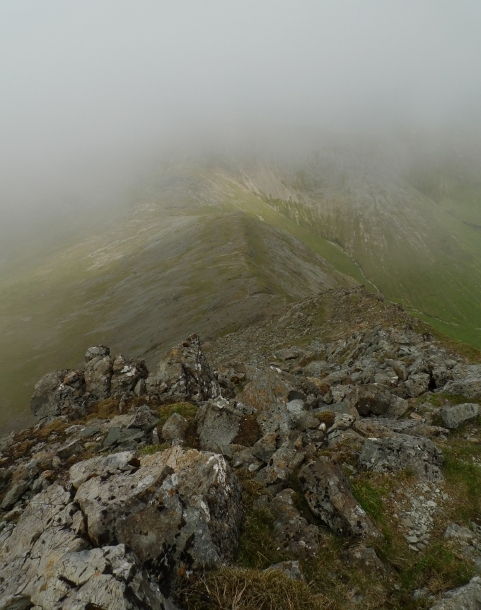 Strangely the clouds would not pass the ridge that I was standing on. To the north there was a great wall of the stuff extinguishing all views whilst to the south a few tendrils would escape before dissipating. Ahead of me was a fairly easy descent followed by a narrow ridge before a very very steep climb to the summit. It was pretty atmospheric watching the mist blow across the ridge. 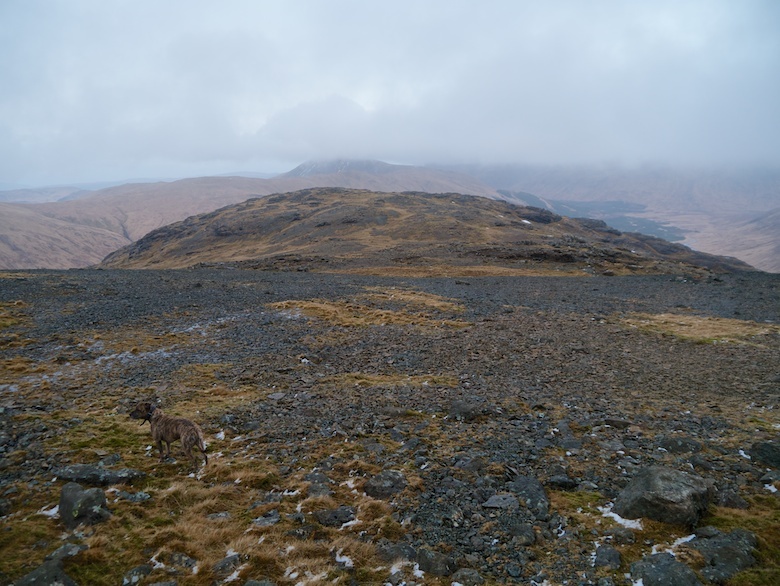 Once again the scale of the scene was brought home when I spotted a couple of figures walking along the crest of the ridge, unfortunately lost in the photos below. 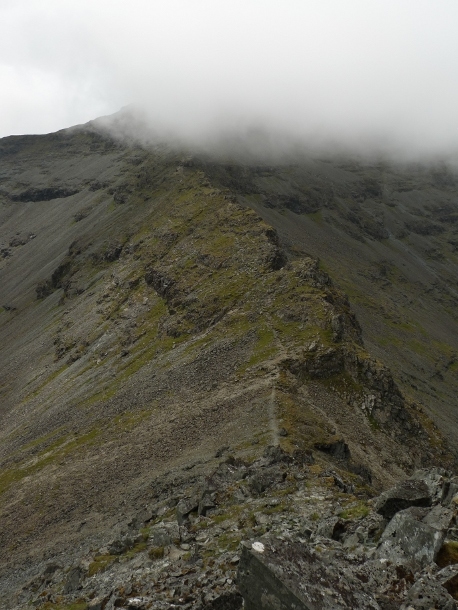 There is actually a path that contours to the left of the ridge but it looked like it crossed scree and loose slopes. I found it pretty easy going to stick to the crest where there were some spectacular views, the ones directly down made me feel a little giddy. Looking back up at A’Chioch. 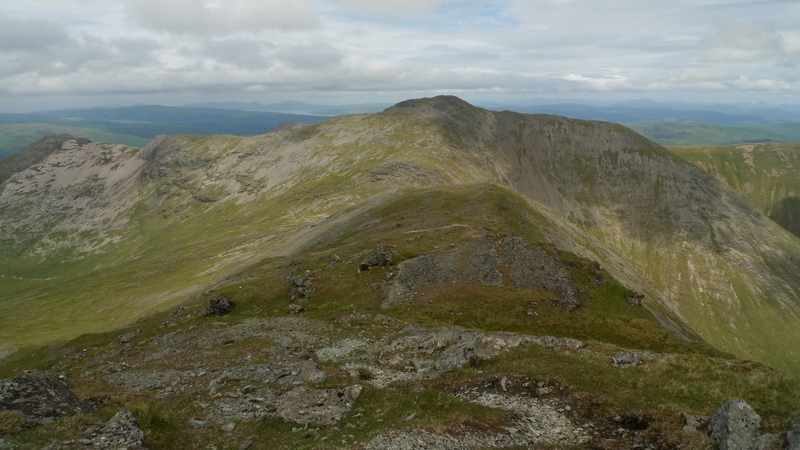 The summit of Ben More began to take on more of a conical appearance the nearer I got to it. 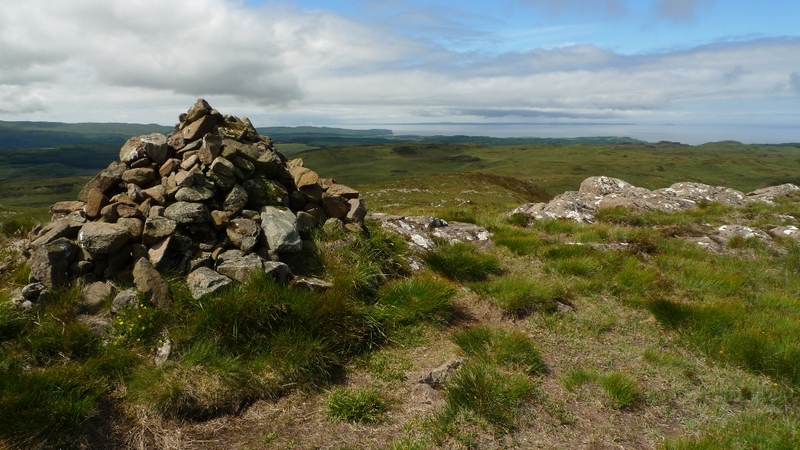 I managed to stick to the crest of the ridge until it joined the main bulk of the mountain where very steep slopes led direct to the summit cairn. 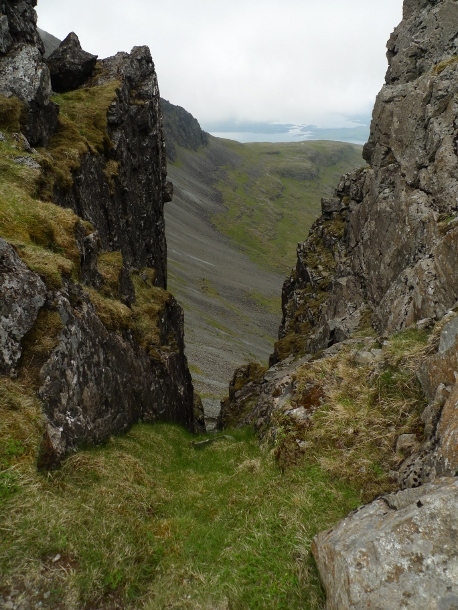 Here I found was the only real scrambling of the day although at no time was it too difficult. There were less steep slopes to the left but they looked really loose and not much fun. 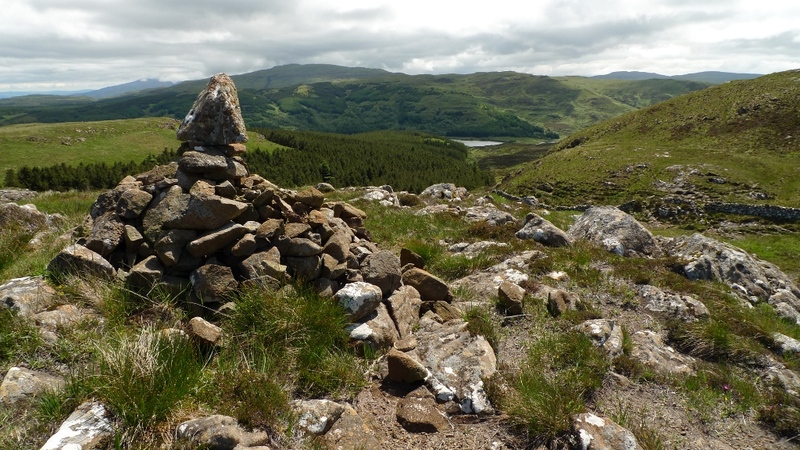 I was greeted at the summit cairn by an American woman telling me, “That is a really stupid way to come from”. I was a little dumbfounded at the statement and did not really say anything back, although moments later I started to regret not telling her she had a stupid face. This was mainly down to her annoying voice disturbing my lunch from the other side of the cairn. 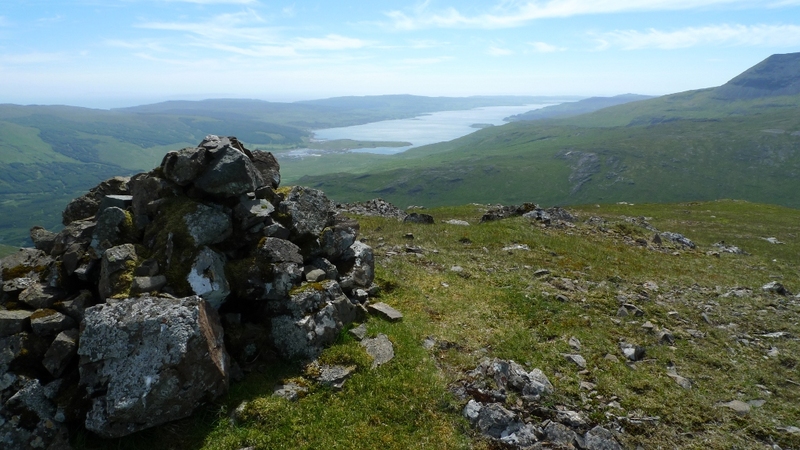 There was no view to enjoy so rather than listening to her prattle on to her rather quiet partner I packed up and headed down the main path which descends the north west ridge. Although easy going down it must be a long long slog coming up this way. 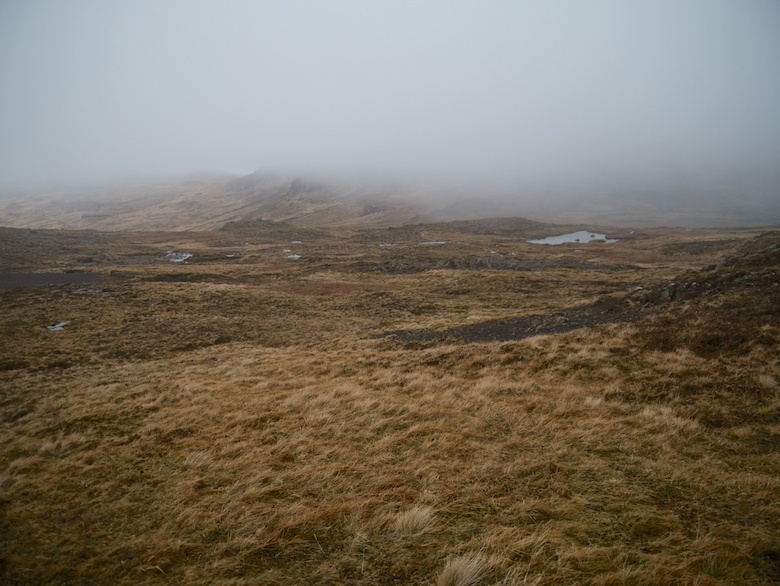 It was nice to finally come out of the mist which was now down to less than 500 metres. The path crosses the Abhainn Dhiseig where I found a collection of rather nice yellow flowers. 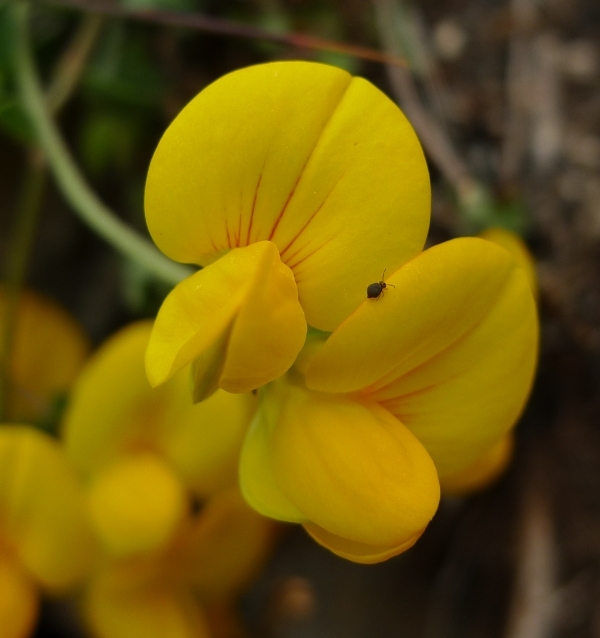 If you could name both the flower and the bug that would be good! From the river crossing it is a simple descent across easy moorland to Dhiseig where you join the driveway to the house. There is a car park on the grassy verge here as it is the starting point for the main path up the mountain. It was then a simple case of a good stomp back to the van along the narrow road, although there are often nice grassy verges to soften the blow to tired feet. Even the passing traffic does not detract from the splendid scenery along this stretch of the coast. Back at the van I spent a very enjoyable evening in a location that is just about as good as it gets. 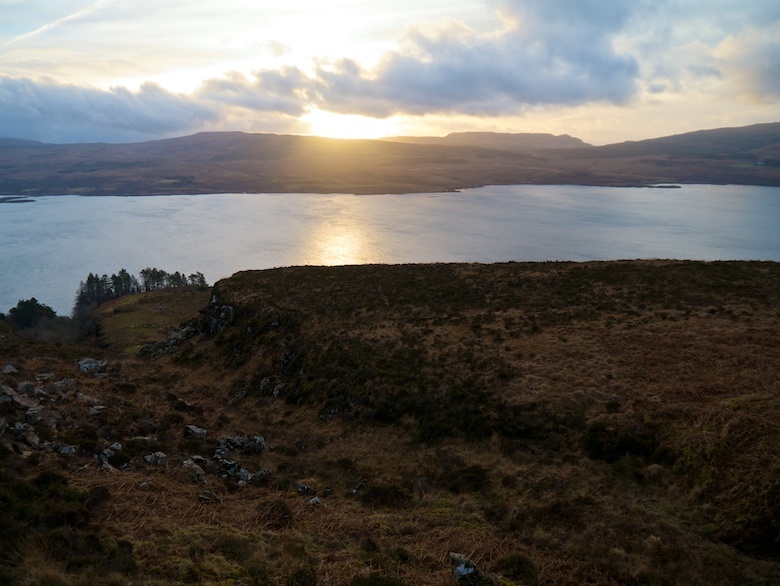 I relaxed with a pile of TGO magazines I had been saving, stuffed my face with food and watched the light change as the sun descended towards the horizon. All from the comfort of the trusty Bongo. I started to think about what I would do the following day as the weather forecast was promising a cloud base down to sea level. Not sure if that could be right I decided to wait and see what the morning would bring and plan around that.